Macrosiphum is my favorite aphid group, getting my start on its diversity and field biology way back in undergraduate years with exploration of the first host alternation of a fern-feeding species. In those days Sitobion was still used for some of the species now considered Macrosiphum; this brings up the point that the name Macrosiphum is now used for what is likely a polyphyletic assemblage of species. Some day it might turn out to be better thought of as 2, 3, or more genera. Jensen, A.S., J.D. Lattin and G.L. Reed. 1993. Host plant alternation in two fern-feeding Sitobion Mordvilko. 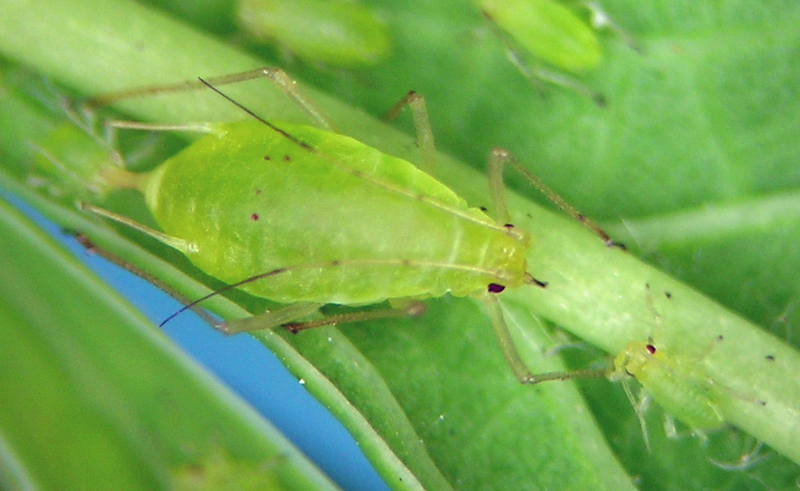 in: Critical Issues in Aphid Biology: Proceedings of the 4th International Symposium on Aphids. P. Kindlmann and A.F.G. Dixon, eds. 142 pp. Since then I finished a Ph.D. studying this group, and published 18 new species (so far, more to come). My impression of this group is that there has been recent and rapid diversification, especially so in western North America. There are many tightly host-specific species that are morphologically similar. But you should be able to see from the coverage of species here on AphidTrek that Macrosiphum species come in many beautiful colors and live in some fabulous ecosystems. Jensen, A.S., R. Peña-Martinez, A.L. Muñoz-Viveros, and J. Rorabaugh. 2019. A New Species of Macrosiphum Passerini (Hemiptera: Aphididae) from Mexico on the Introduced Plant Pittosporum undulatum. Proceedings of the Entomological Society of Washington 121: 39-53. Jensen, A.S. 2017. Two New Species of Macrosiphum Passerini (Hemiptera: Aphididae) from Dry Forests of Western United States. Proceedings of the Entomological Society of Washington 119: 580-600. Jensen, A.S. 2015. Two New Species of Macrosiphum Passerini (Hemiptera: Aphididae) From Western North America. Proceedings of the Entomological Society of Washington 117: 481-494. Jensen, A.S. 2012. Macrosiphum (Hemiptera: Aphididae) Update: One New Species, One Synonymy, and Life Cycle Notes. Proceedings of the Entomological Society of Washington 114: 205-216. Jensen, A.S. and C.K. Chan. 2009. Macrosiphum living on Fumariaceae in northwestern North America, including one new species (Hemiptera: Aphididae). Proceedings of the Entomological Society of Washington 111: 617‑626. Jensen, A.S. and J. Holman. 2000. Macrosiphum on ferns: taxonomy, biology and evolution, including the description of three new species (Hemiptera: Aphididae). Systematic Entomology 25: 339-372. Jensen, A.S. 2000. Eight new species of Macrosiphum Passerini from western North America, with notes on four other poorly known species (Hemiptera: Aphididae). Proceedings of the Entomological Society of Washington 102: 427-472. For some years this species was a major collecting goal of mine. 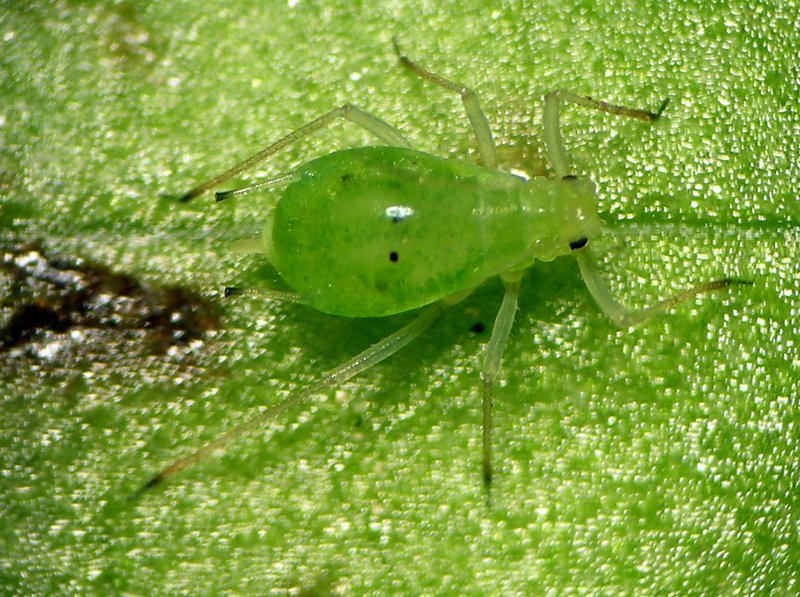 I collected on geraniums of all kinds for many years before finding this aphid for the first time in 2010 in New Mexico. Since then, I’ve found it many additional times, including fundatrices and sexuales, proving monoecy. I find it on what I call Geranium richardsonii, a plant that seems to have a wide variation in habitat preference and is irritatingly similar to G. viscosissimum where their ranges overlap. This aphid seems to live only in the mountains, and I have specimens from Oregon, Idaho, Utah, New Mexico, and Arizona. Macrosiphum aetheocornum from central Oregon in June. 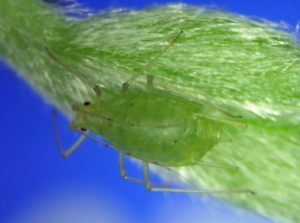 This aphid is one of the largest in the world, and is actually familiar to many flower gardeners: it feeds on lupins (Lupinus) and is sometimes called the ‘lupin aphid.’ It is widespread in North America and has spread elsewhere as well with its cultivated lupin hosts. In natural systems, M. albifrons seems to be able to feed on many species of Lupinus, however, some samples seem to differ morphologically from others. I have suspected that more than one species may be involved, but have not had the time, resources, etc. to study the situation in detail. 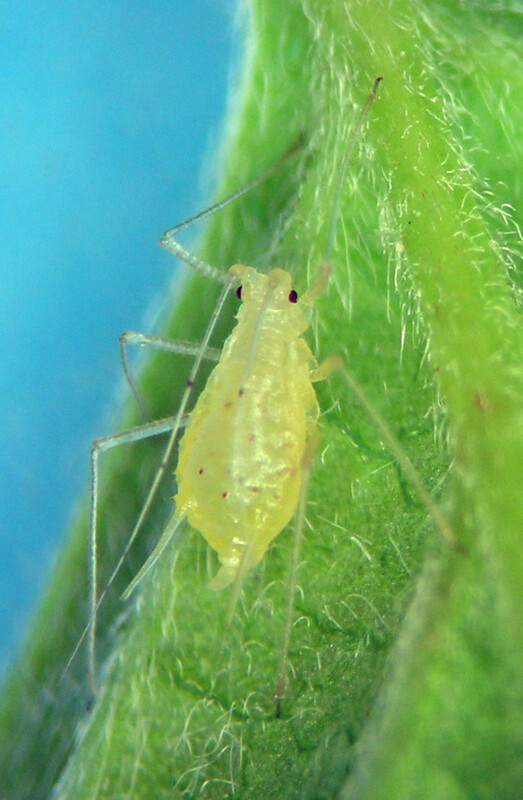 A very similar species is Macrosiphum zionense (see below), which lives on a lupin-like legume called Thermopsis in the mountains of inland western North America. Macrosiphum albifrons aptera posing for her photo. 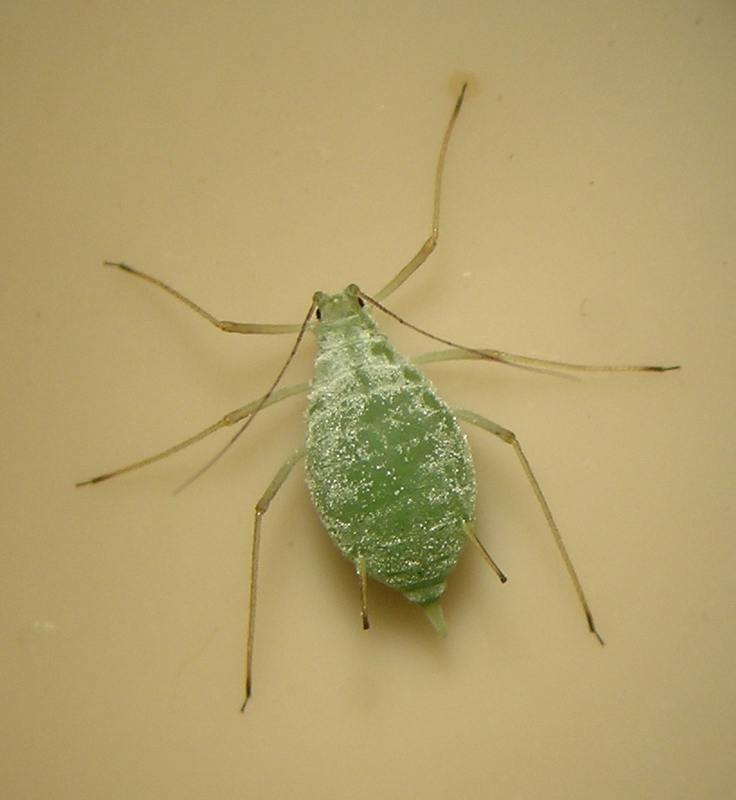 In 2000 this aphid was only known from Washington and Oregon, but I have since collected it in Idaho and Montana. Macrosiphum badium aptera from the Cascade Range in Washington. This is the name used for Macrosiphum feeding on species of Salix (willow). Based on 30 years of collecting, it is clear to me that there are at least two species of Macrosiphum using Salix as host. The main distinction between them is the number of setae on the cauda, but other features seem to vary by species as well. The most common of the species is closely related both morphologically and ecologically to the Macrosiphum found on Cornus (dogwood) that is elsewhere thought to be M. hamiltoni (an idea I disagree with). I have tried a couple host-plant transfers between Cornus and Salix, with interesting but not yet conclusive results. Some of the specimens on Salix have bold dorsal internal stripes as in the photo below, while other specimens are a simple plain green with mostly dark siphunculi. Check back in a few years, and maybe I’ll have published the results of my research on this group. Macrosiphum on Salix from the Warner Mountains of Oregon in September of 2018. Macrosiphum claytoniae aptera from the forest at the edge of the Willamette Valley, Oregon. time, but was not proven until the winter of 1993 when sexuales were not recovered from field colonies and did not develop in the laboratory. Also during this winter there was a 15 cm snow fall followed by temperatures as low -8°C. During the last day that snow lay on the forest floor, aphids were observed under the snow in cavities formed by overlying fern fronds. 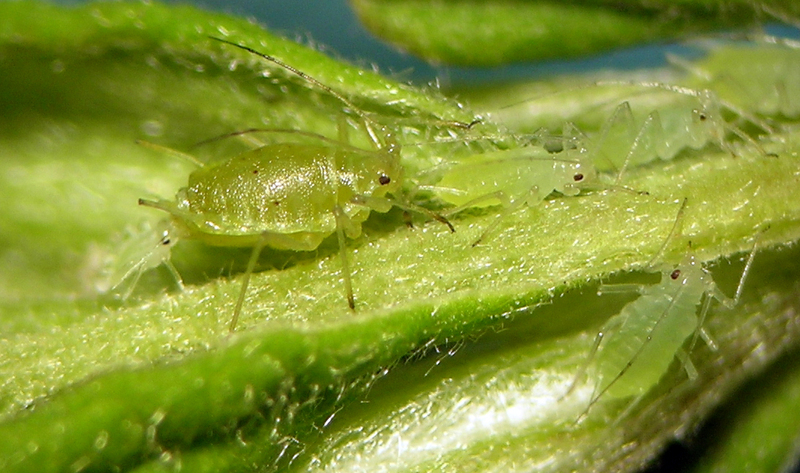 Temperatures at the time were about 2°C, and aphids were capable of sluggish movement when prodded. Macrosiphum claytoniae is known only from British Columbia, Washington, and Oregon. A recently described new species, which I was alerted to by Blackman and Eastop’s books years ago. After many years of hunting on various Clematis species (none of which I could initially identify to species), I finally stumbled on this aphid using my standard beating tray technique of 30×30 cm plywood and paint stirring stick, tapping haphazardly on Clematis ligusticifolia. Macrosiphum clum fundatrix from above the Alvord Desert in eastern Oregon. 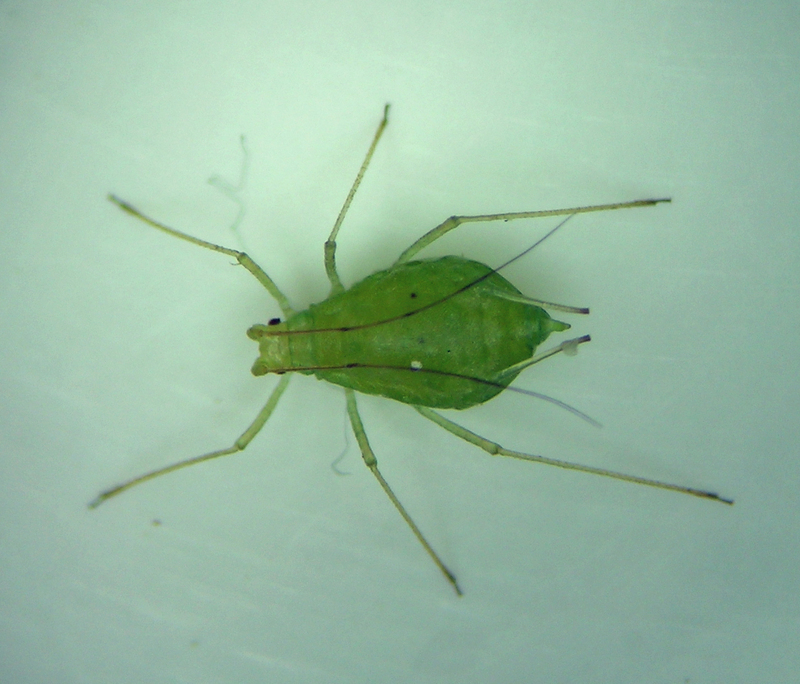 Subsequently, I learned to find this aphid fairly reliably, and finally described it in 2015. In that paper I wrote, “This species lives in low densities on its host plant, mostly in exposed and dry or rocky sites. Numerous patches of C. ligusticifolia have been searched, and only a small percentage seem to host M. clum. 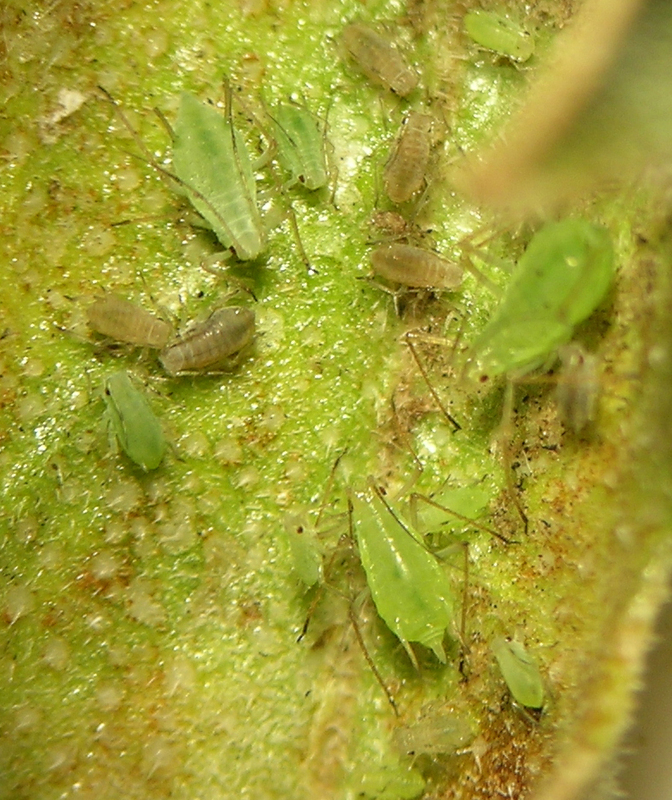 Almost all collections of this aphid have been made by beating the plants over a wooden board. 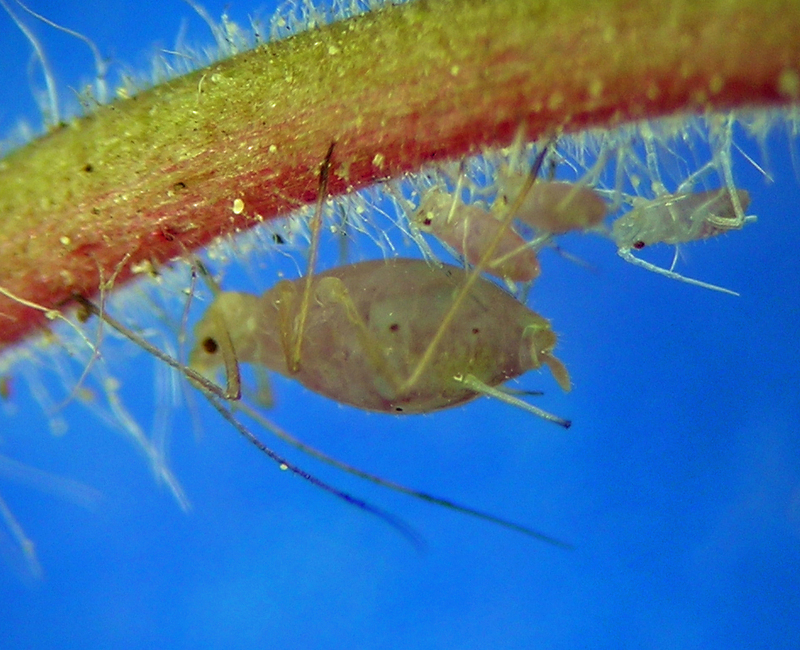 The aphids live so well-concealed on the leaves that the only time specimens were seen without beating was when they lived in some numbers on etiolated stems growing in the relative dark under a bridge near Weatherby, Oregon. Sites where M. clum was found were usually low elevation, near rivers in otherwise near-desert locations, and the plants were often rooted among boulders and growing up rock walls, along bridges, etc. In some cases I labeled slides with only the genus Clematis as host – this is simply due to my initial uncertainty about Clematis taxonomy. Clematis ligusticifolia is found from southern British Columbia and Alberta in the north to New Mexico in the south (Kershaw et al. 1998).” I still have specimens from only Washington, Oregon, and Idaho. Macrosiphum clum from Coffeepot Lake in eastern Washington. This is one of my most familiar species of Macrosiphum, and one of 4 that feed on bracken fern, Pteridium aquilinum. When in grad school in the early 1990s I worked out the taxonomy of all 4 species, including some mix-ups that had occurred in previous literature regarding identities of various fern-feeding Macrosiphum. Macrosiphum clydesmithi fundatrix and her nymphs on Holodiscus in May in northern Idaho. I published the results with a distinguished co-author, Jaroslav Holman, in 2000. Back then I wrote about this species’ biology: “Robinson (1980) described M. clydesmithi from material collected in Utah and Oregon on bracken fern, Pteridium aquilinum (L.) Kuhn. At that time its life history was not known. Jensen et al. 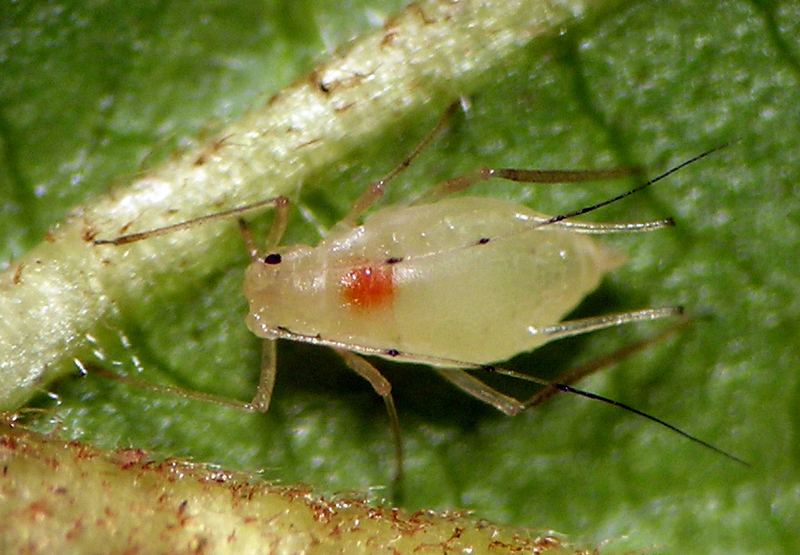 (1993) reported the heteroecious life cycle of this aphid, demonstrating that its primary hosts are species of Holodiscus (Rosaceae). It was found on Holodiscus discolor (Pursh) Maxim. in the lower elevations and higher latitudes of Oregon, and on Holodiscus dumosus (Hook.) Heller in the mountains and more southern parts of its range in Oregon. Holodiscus discolor is also the primary host of M. pteridis (see below, under that species). 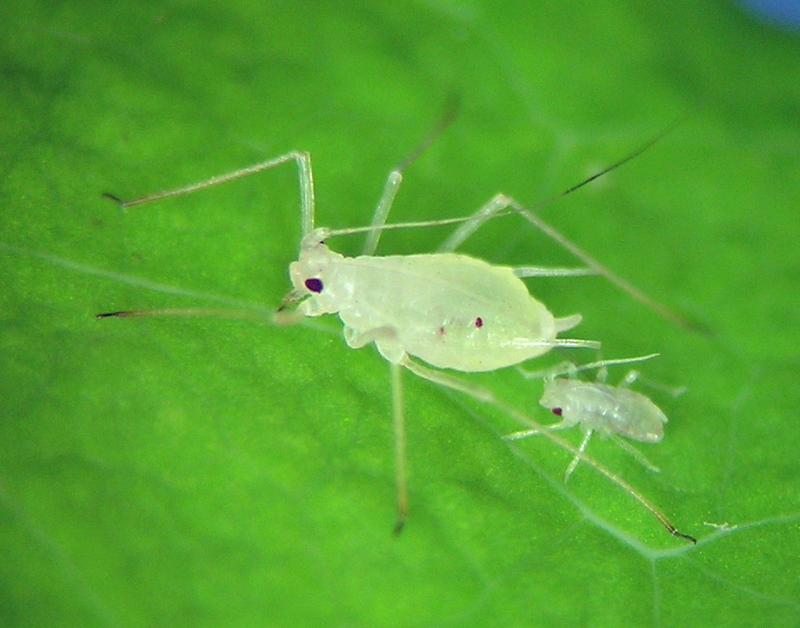 In areas of western Oregon where the two aphids both live, their phenologies differ markedly from one another in the autumn. Macrosiphum pteridis remigrates to Holodiscus a few weeks earlier than does M. clydesmithi, which may not arrive on Holodiscus until most of its leaves have fallen in October. Mating then occurs in M. clydesmithi on the last remaining leaves in November. On Pteridium, M. clydesmithi is most often found in exposed sites such as open fields and roadsides. It is not tended by ants despite the fact that it sometimes co-occurs with M. rhamni, which is often ant-tended.” In those days I studied this species on Holodiscus discolor ssp. discolor, which is a tall, upright shrub in and on the edge of coniferous forests. 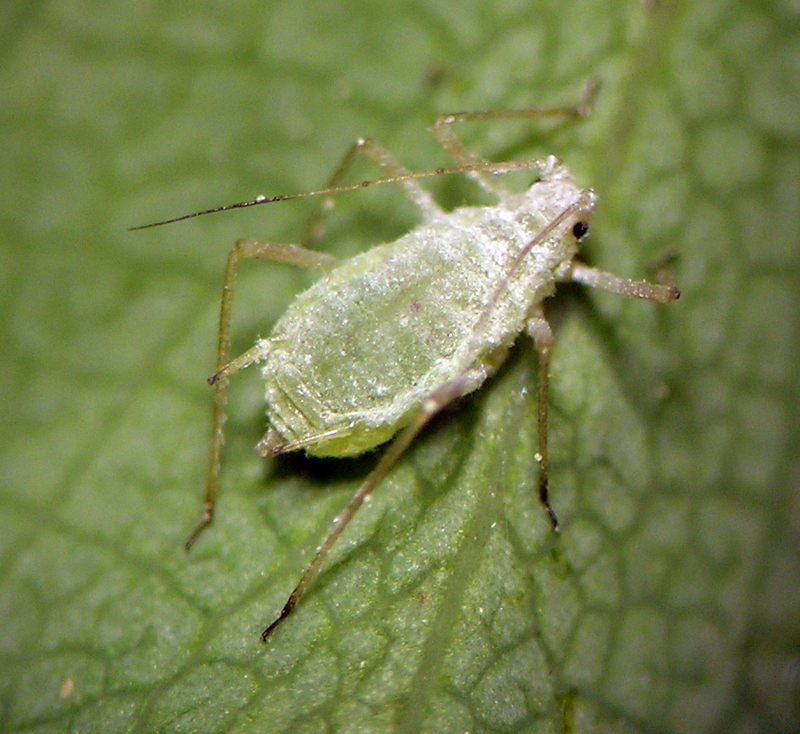 Since then I have found that this aphid is one of the common species feeding on Holodiscus discolor ssp. dumosus in rocky outcrops on the edges of mountains and cliffs at moderate to very high elevations. I now have material of this species from Washington, Oregon, California, Idaho, Colorado, and New Mexico. It surely occurs in Arizona, Utah, etc. also, but I have not made a priority of collecting it since grad school. Macrosiphum clydesmithi ovipara on Holodiscus in October in northern Idaho. Macrosiphum clydesmithi apterous vivipara on bracken fern in July in northern Idaho. This species is one of many that are very similar morphologically to M. euphorbiae, but that have distinct biology and ecology. M. creelii specializes on legumes, particularly Vicia and Lathyrus. It is often bigger than a typical M. euphorbiae, but not always. During many years of pursuit, I eventually gathered material of all morphs from fundatrix to sexuales. One of my favorite habitats to collect this species are the famous public beaches of Oregon. Just at the edge of high-tide water line there often grows a large Vicia, and on that there is almost always the largest and most dramatic specimens of M. creelii. In our local southern Oregon Ponderosa pine forests, M. creelii is uncommon but widespread on native Vicia and Lathyrus growing in the shade of conifers. Macrosiphum creelii from the Fremont-Winema National Forest, a fork of Coffeepot Creek. This is one of my two new species described in 2017. Dewsler and Andy, April 2013. It is yet another example of a species I’ve known about for a long time, but spent 12 years gathering adequate information and specimens to support a good description. It is named after one of our deceased dogs, Dewey (also known as Dewsler, Mr. Dewsler, and Dewsldoerfer). small above-ground shoots ready to grow immediately when conditions allow. The earliest collection I have made of M. dewsler was 3 June 2016 south of La Pine, Oregon. At this location, early June is very early spring in terms of plant growth, yet L. lewisii was in bloom and the aphid population thriving. I have not collected confirmed fundatrices of this aphid, the only possible specimens being these on 3 June 2016. I considered these specimens to most likely not be fundatrices, which means that egg hatch and population establishment must have happened remarkably early at this location. 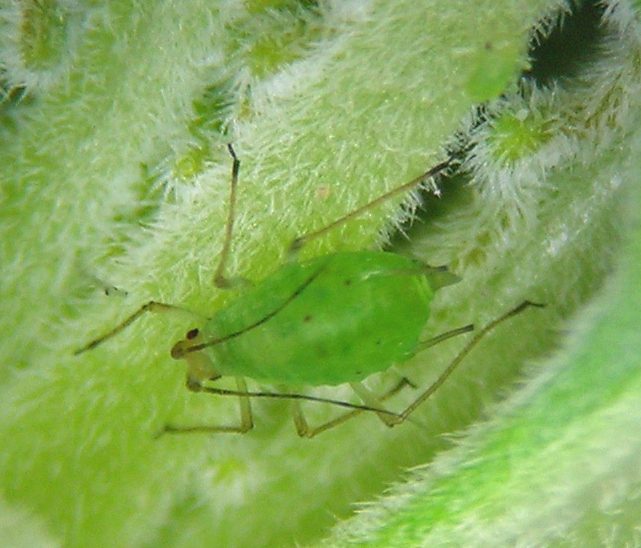 Aphid populations persist on the plant stems after petal fall and during fruiting, seemingly able to reproduce throughout the dry summer months. Alate viviparae are rare, possibly produced only during certain stages of the season or of plant growth, considering that my only alate specimens are from early in the growing season (early July in the mountains of northern New Mexico and early June in the mountains of southern Oregon). 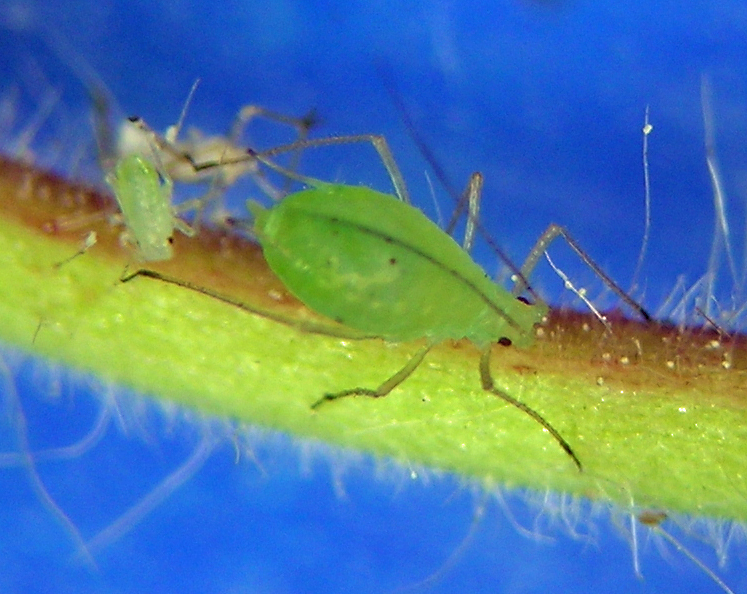 In life, this aphid is difficult to see on Linum plant stems, as individuals feed cryptically among the leaves. Macrosiphum dewsler apterous vivipara from near Lakeview, OR. This is the second new species I published in 2017. It is named after my undergraduate and graduate supervisor and mentor, Gary Reed. Gary Reed in Hermiston, 2009. 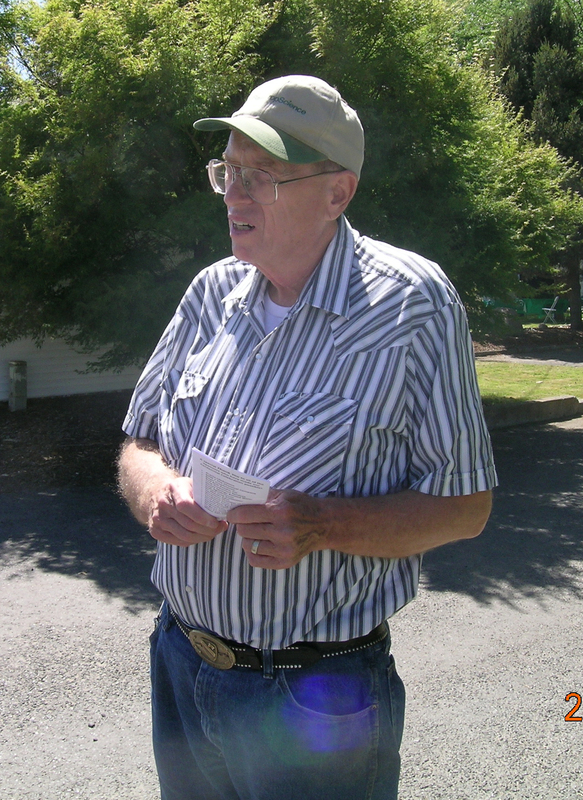 Gary was an entomologist and superintendent of the Oregon State University Hermiston Agricultural Research and Extension Center in eastern Oregon. He supported me through 8 years of my life, including paying for my Ph.D. education and supporting my work in systematics of aphids. 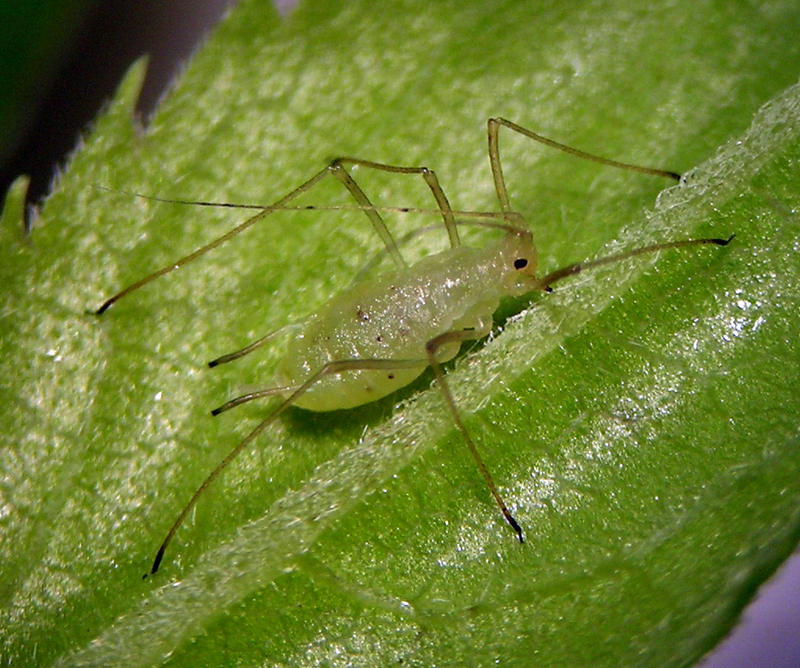 I wrote about this aphid: “This species is monoecious holocyclic on its host plant, Geum triflorum. It was first discovered by Gary Reed in the early 1990s feeding among the developing achenes in the flower heads, but most of the season it feeds on the stems and leaves. This plant has a similar over-wintering strategy as L. lewisii, discussed above, in that it overwinters with basal leaves intact, and ready to grow immediately in spring. I have often observed flower heads extremely early in the spring, indicating that the plant must grow during warm spells in winter. This produces a situation wherein fundatrices of M. garyreed are able to develop and deposit their offspring on the flower stems and buds of a strongly growing plant early in the season. Although I have known about and collected this species since the early 1990s, it has been difficult to find the sexuales in the fall. After blooming and seed drop, G. triflorum enters a more or less dormant vegetative state during late summer and fall during which M. garyreed is hard to detect and collect due to low population densities. 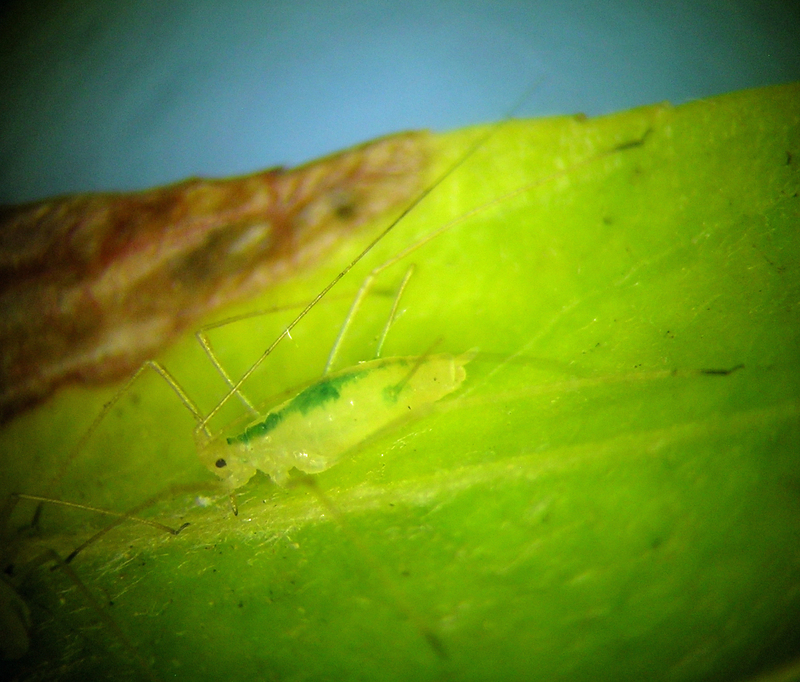 Until the fall of 2016 I had never collected this aphid late enough in the fall to find the sexuales. My single collection site of sexuales was on a place called Winter Rim in southern Oregon in early October (8 October 2016). As suggested by the place name, Winter Rim is a cold and windy high-elevation ridge. When I collected sexuales of M. garyreed there, almost all other aphids were gone, long previously either migrated away or in hibernation as eggs. Among the leaf litter were G. triflorum plants with both green and senescing leaves, the latter bearing many nymphs and adults of M. garyreed. Macrosiphum garyreed in its pinkish color form, from the mountains of central Idaho. Macrosiphum garyreed in its green form, from the mountains of central Idaho. 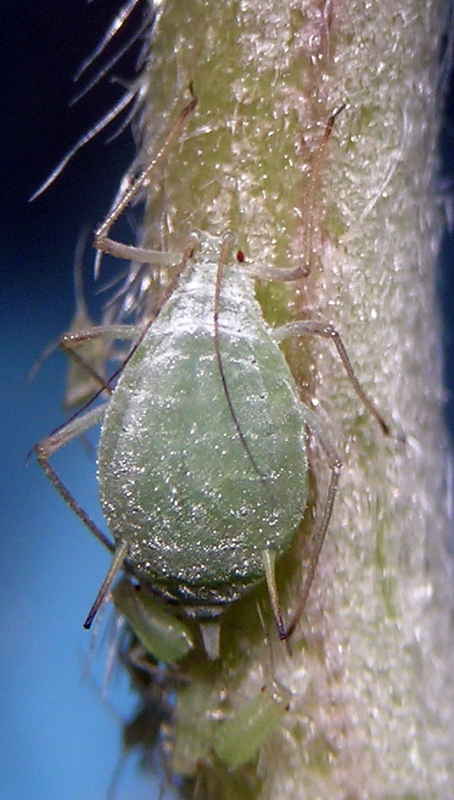 Locally common, this aphid is probably a complex taxon composed of two to four species. Out west in my area, this aphid feeds on Gaura and can be found in various habitats. Its siphunculi are less reticulated apically than most Macrosiphum, and the tarsi look fat to me. In Maine it is mostly found on native Oenothera, and the siphunculi look rather different but the tarsi are still fat. In the south such as Florida and Texas, what might be called this species can be pink and have almost entirely dark siphunculi (much darker than in the photo below); these live on Oenothera and Gaura. In the old days of aphid taxonomy, there’s no question that they would all be described as separate species due to their morphological disparity. Today, after having many samples from across North America at my disposal (when I borrowed material from a couple collections), I still think there are likely 2 or more species, but can see why the current dogma is one of lumping: there IS a lot of variability across the continent but all specimens share some features like fat tarsi, convincing me of their relatedness. From the lumper’s perspective, I have material of this ‘species’ from Oregon, Colorado, New Brunswick, and Texas. Macrosiphum gaurae from eastern Oregon in May. Macrosiphum holodisci fundatrix from the Hayden, Idaho area. 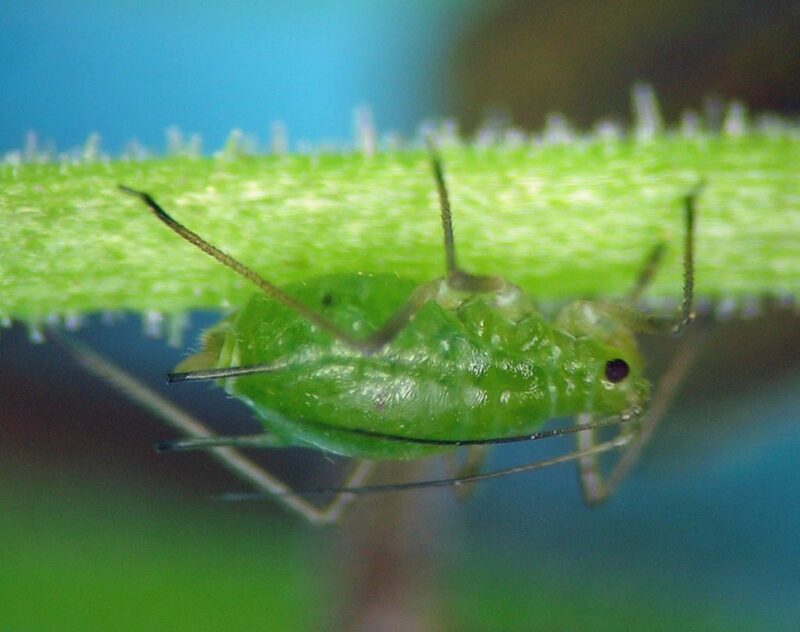 This aphid is a source of embarrassment for me because it is one Macrosiphum species whose full host plant biology has eluded me for my whole aphid research career. 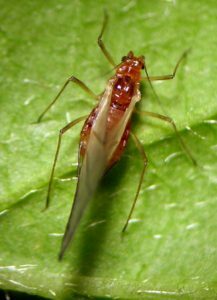 It was one of the first Macrosiphum species I studied in the field outside Corvallis, Oregon in McDonald State Forest. Macrosiphum manitobense fundatrix from the shores of Moses Lake in central Washington. It was common there in spring and fall on Cornus stolonifera. It was obvious that a secondary host was utilized in the summer: all colonies in spring matured into alate viviparae and emigrated in April and May, and in September and October alate viviparae and males returned to Cornus. This was seen year after year. Since that time I have collected this aphid elsewhere, in far flung places like Moses Lake, Washington, and Jemez Springs, New Mexico. 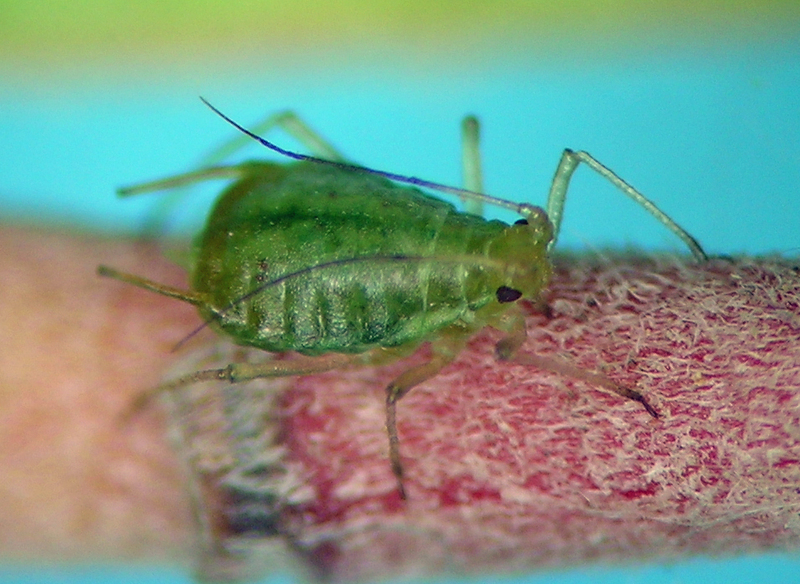 But, after 27 years of aphid collecting, I still have not turned up this aphid on its secondary host. Its short cauda has lead me to speculate that it may utilize the lower parts or underground parts of a secondary host. Even with this idea in mind, I have not found it anywhere but Cornus in spring and fall. It is locally common, and obviously widespread, but in almost all places I look at Cornus stolonifera this aphid is not apparent. The most obvious explanation for this patchy distribution is the aphid’s likely tie to a secondary host. But what is that plant?? Blackman and Eastop imply that there may be two similar species on Cornus that might be confused under this name. I agree that my material differs slightly from Robinson’s original description, but I think characters such as the unusually short cauda almost certainly indicate at least a close relationship between Robinson’s M. manitobense and mine. I now have this species from Washington, Oregon, Utah, and New Mexico. Macrosiphum manitobense second generation from near the ocean along the Nehalem River in Oregon. This interesting aphid feeds on the strange plant genus Mentzelia (Loazaceae), the species of which in my region are strangely sticky. I think the sensation of stickiness is actually caused by a thick covering of trichomes (see photo). I have only been collecting this aphid for a decade or so because it was only then that I learned how to recognize and find Mentzelia in my collecting. It is an unusual plant in that it is most commonly found in dry places along roads in the northwestern U.S.A. — in such places I don’t spend much time collecting. The most common host for this aphid in central Washington is the very showy Mentzelia laevicaulis, and I have collected it several times from a more diminutive species, probably M. albicaulis, and in New Mexico I’ve gotten it from a tall Mentzelia with big white flowers. I have material of this species from Washington, Oregon, Idaho, Colorado, New Mexico, and Arizona. Macrosiphum mentzeliae from central Washington. 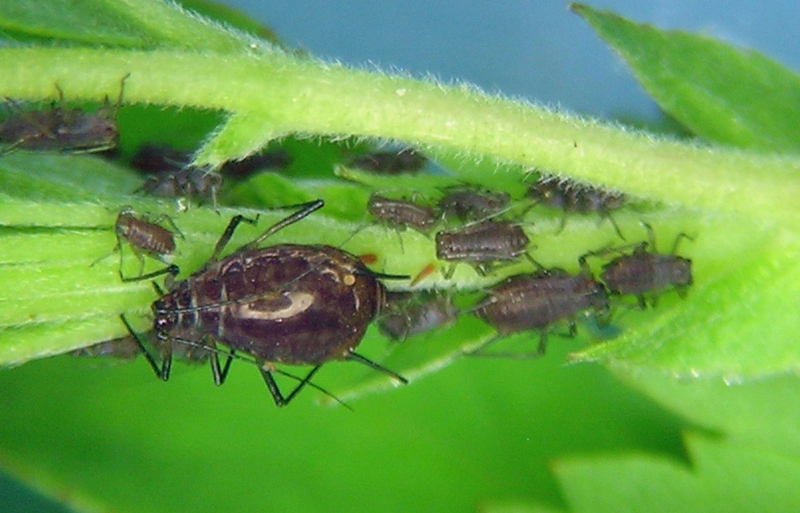 The brownish nymphs will develop into males. Macrosiphum mentzeliae fundatrix from the Leslie Gulch area in eastern Oregon in March. 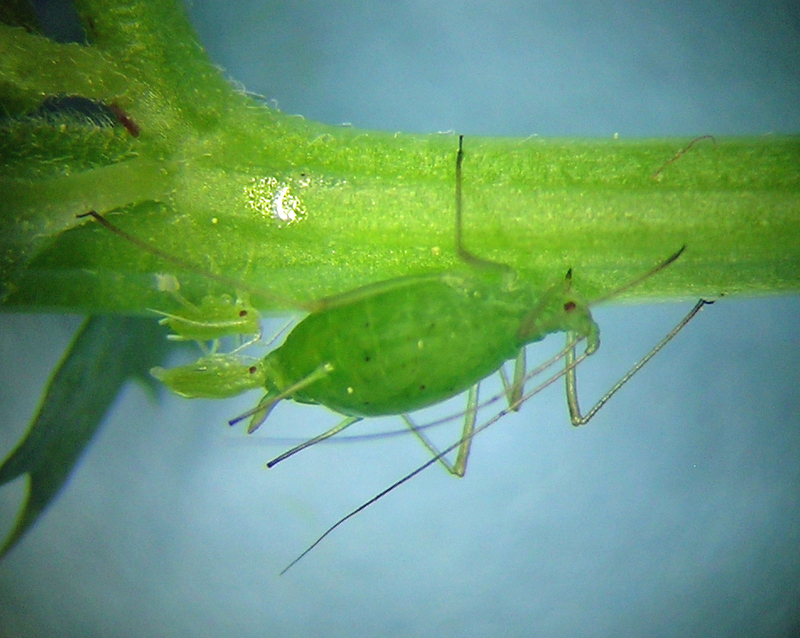 This is a very early aphid for that region, in part because of the very warm and dry sites where M. laevicaulis grows. Macrosiphum mentzeliae apterous vivipara from Coffeepot Lake in eastern Washington in August. I still vividly remember the first time I found this aphid — it was in the Blue Mountains near the border of Washington and Oregon. We’d camped in a cool drainage that doubled as a trailhead for a major cross-wilderness trail for hunters and backpackers. Macrosiphum niwanistum apterous vivipara from the Blue Mountains. The forest was alive with beasts, probably all deer, but in the dark of night, one never knows. In the morning I arose to collect aphids as always, mostly right near camp among all the big fleshy wetland plants such as this aphid’s host, Mertensia (blue bells). To my delight, the aphid was abundant and looked just like I read about in Hottes original description. Most specimens live on the lower leaves of the plant, are covered in a light wax, and drop very readily from the plant when disturbed. 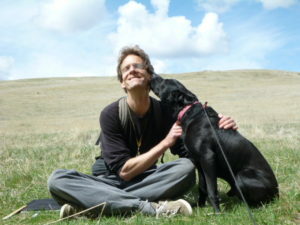 As I worked my way back toward the tent where Gina and Bumble still lounged, a man and a dog came down the trail! The other end of the trail I knew to be about 17 km away, and the man and dog had no pack or water. The dog arrived, and slumped immediately into a puddle in the trail at my feet. The man carried a gun in a holster, and nothing else. He explained that he was a trail maintenance contractor and had walked the full length of the trail that morning to scout how much work was needed to renovate the trail. I offered him food and water, which he declined except for a couple gulps of water, he called his dog, and they headed back. Ever since then I call him the hiking man — doing more hiking in the morning before breakfast than I want to do in a whole weekend. 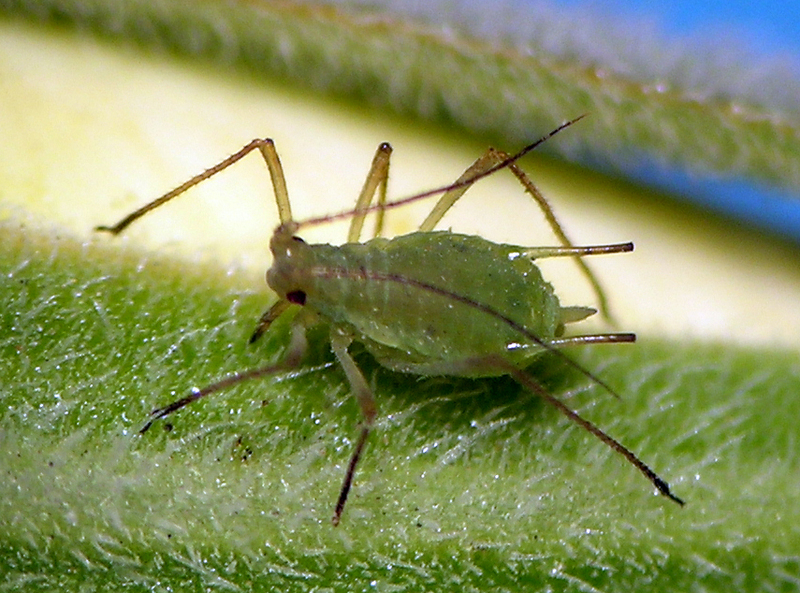 This aphid turns out to be quite common and widespread. I have it from Washington, Oregon, Idaho, Utah, and Colorado. Macrosiphum niwanistum fundatrices and their nymphs from the mountains outside Boise, Idaho. As I noted years ago on my Flickr page, Macrosiphum-like aphids I collect on Eurybia conspicua are probably best identified as Macrosiphum olmsteadi Robinson. The other possibly correct species name is Illinoia (Masonaphis) magna (Hille Ris Lambers). As far as I can tell from review of paratypes of M. olmsteadi and the original descriptions of both species, the main discrepancy between the two is number of setae on tarsal segments 1: 5 on I. magna and 3 on M. olmsteadi. The two share distinctive characters such as the slightly clavate siphunculi, spinulose tarsi, setose tibiae and rostrum, etc. Both are recorded from species of aster in the genus Eurybia. Obviously this is another case of the muddled taxonomy of Illinoia vs. Macrosiphum that underlies our current aphid classification. 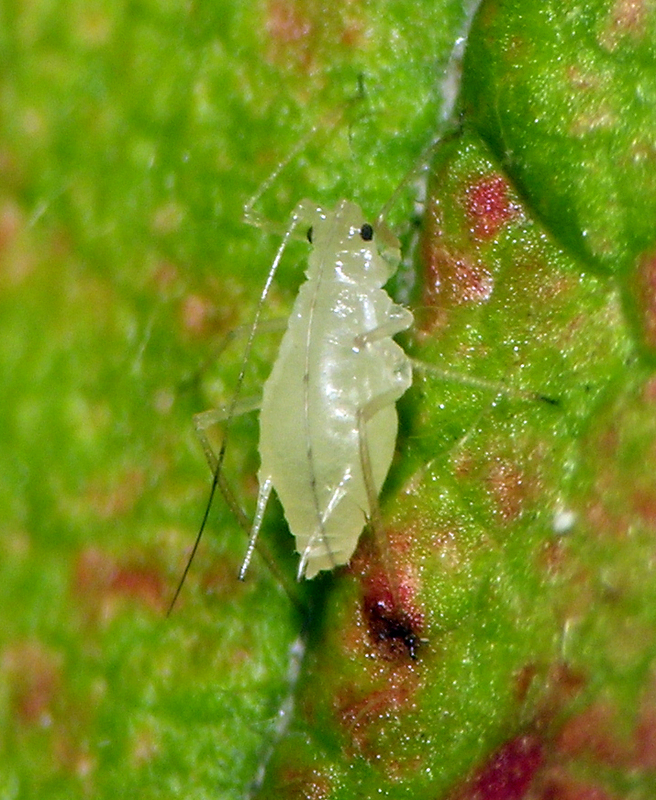 The aphids I identify as M. olmsteadi live on Eurybia conspicua in the interior mountains and foothills of Idaho and neighboring states and provinces. This plant is interesting on its own — being a perennial herb that commonly grows on the forest floor and rarely blooms. My interpretation of its biology is that it establishes in forests and grows only vegetatively until an opening in the forest canopy from tree fall allows adequate light for it to bloom. 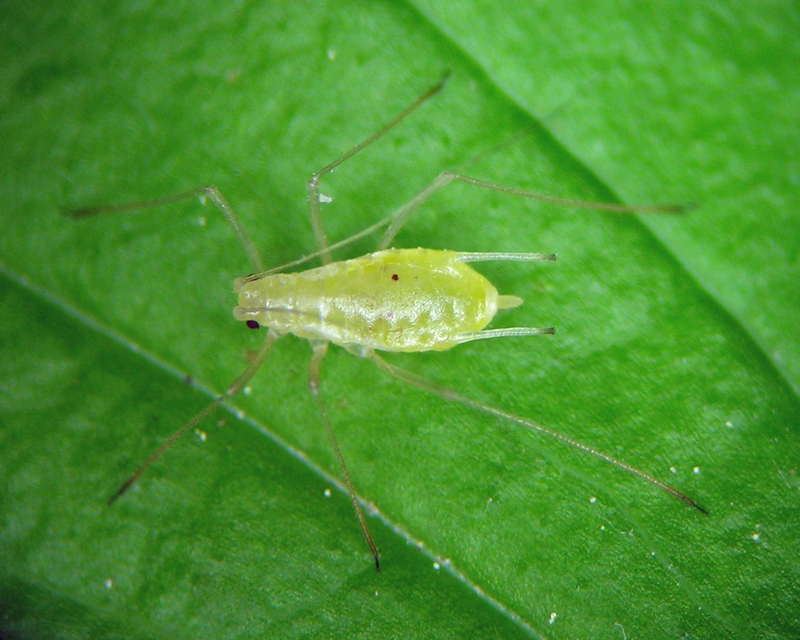 This aphid is common on its host plants in shaded forest and also on the rare flowering specimens, feeding mostly on the undersides of leaves. I have specimens from Idaho, Washington, Oregon, and Alberta. Macrosiphum olmsteadi apterous vivipara from northern Idaho in June. This species I finally described recently after many years of collecting it occasionally in its mountain habitats. It was only after the paper came out in 2012 that I realized how long the species name is and that it hardly fits on a slide label and is a real bugger to write repeatedly. As I wrote back then, “This species is monoecious holocyclic, but unusual in the breadth of its overwintering host range. It has been collected mostly in the mountainous areas of Oregon, Washington, Idaho, and western Montana, but also near sea level in the Seattle, Washington and Vancouver, British Columbia metro areas. Host plants so far recorded for M. opportunisticum include: Altingiaceae – Liquidambar styraciflua L.; Caprifoliaceae – Symphoricarpos sp. ; Celastraceae – Paxistima myrsinites (Pursh) Raf. ; Ericaceae – Menziesia ferruginea Sm., Phyllodoce empetriformis (Sm.) D. Don, Phyllodoce sp., Rhododendron albiflorum Hook., Vaccinium membranaceum Douglas ex Torr., Vaccinium parvifolium Sm., Vaccinium scoparium Leiberg ex Coville, Vaccinium sp. ; Rosaceae – Holodiscus discolor (Pursh) Maxim., Luetkea pectinata (Pursh) Kuntze, Sorbus sitchensis M. Roem., Sorbus sp., Spiraea thunbergii Sieb. ex Blume, Spiraea sp. 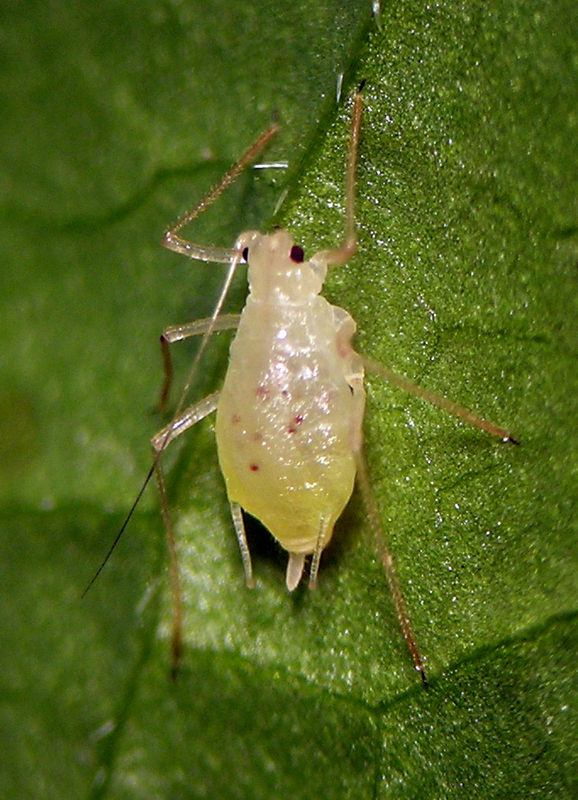 Macrosiphum opportunisticum alatoid nymph, showing the common pinkish color and light dusting of wax that occurs on nymphs. This host range, which includes a non-native tree (Liquidambar), is broader than most aphids, and might be viewed at first with skepticism. Observing M. opportunisticum in nature, however, puts this host range in perspective. 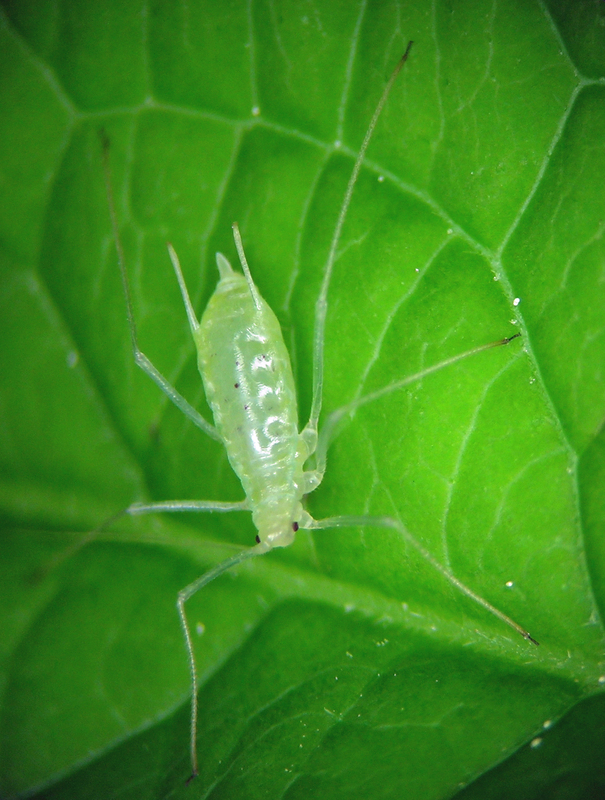 This aphid normally lives in montane habitats dominated by shrubs of various kinds. Observations indicate that it is able to develop on many broadleaf shrubs available in its habitat. For example, in a harsh winter snow may linger well into July, preventing some shrubs from growing until mid-summer. Other shrubs, however, may be taller, or live in microclimates that are less affected by snow. Over several seasons, when searching an area in the earliest parts of the growing season, whenever that occurs as dictated by snow pack and weather, M. opportunisticum can be found on any shrub in the list above (and perhaps others) that are in the best stage of development. 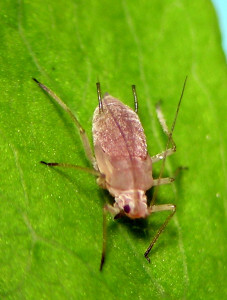 The use of Liquidambar as a host in the Vancouver area supports the hypothesis that this aphid takes advantage of many available host plants. 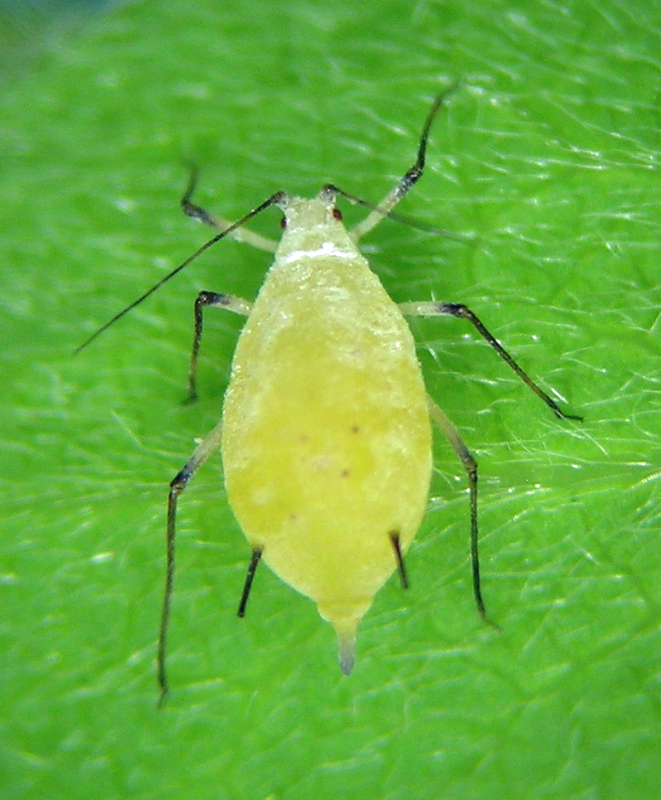 This aphid is widely dispersed on its host plants, with rarely more than one specimen on a leaf or twig. It drops readily from the plant when disturbed. An unusually large proportion of specimens in any given patch of infested host plant are alate or alatoid, and lone alates are frequently found throughout the short summers in its mountain habitat.” Since this paper, I also found M. opportunisticum on Tsuga mertensiana (mountain hemlock) saplings along a mountain road in northern Idaho — a most unexpected host association. I now have this species from British Columbia, Washington, Oregon, Idaho, and Utah. Macrosiphum opportunisticum aptera from the Colockum Ridge of central Washington. Macrosiphum opportunisticum alate vivipara, the green color. This aphid is known from British Columbia, Washington, and Oregon. Macrosiphum oregonense aptera from the Seattle area. 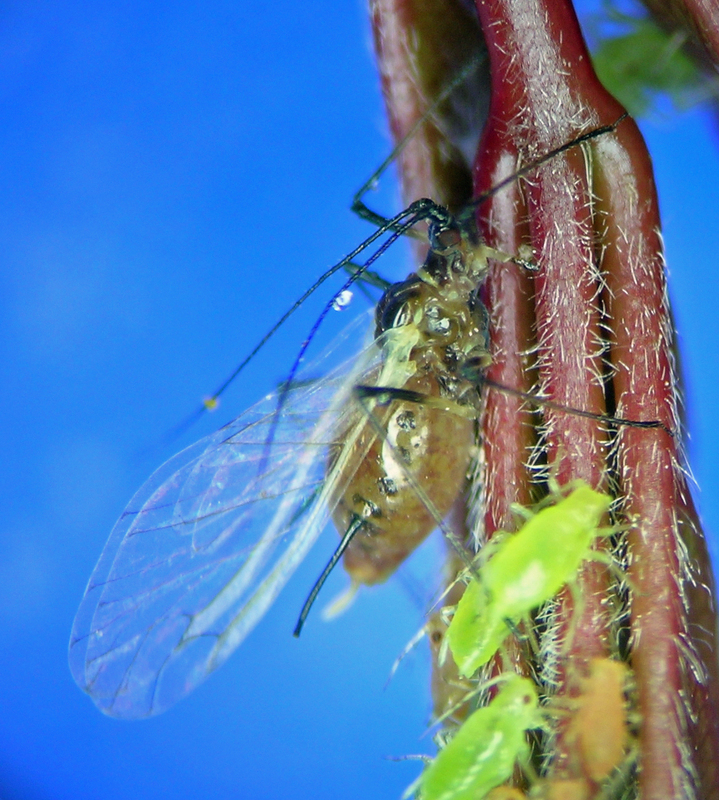 This is one of the 4 species of bracken fern-feeding Macrosiphum aphids that I studied during my Ph.D. work in Oregon. 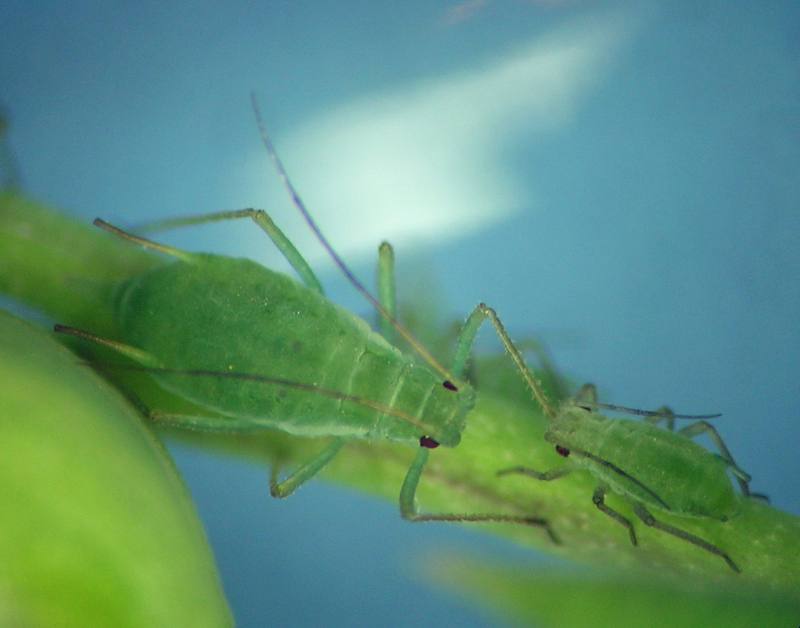 I was the first to show host alternation in any of the fern feeding aphids, and it was even more unusual to study 4 related congeners utilizing the same host plant in the same general habitats. As I wrote about this back in 2000 (see reference above): “The heteroecious life cycle of this species is reported here for the first time. The primary host is Oemleria cerasiformis (= Osmaronia cerasiformis), and the secondary host is P. aquilinum. Egg hatch coincides with bud break in early to mid February in western Oregon. Fundatrices mature from mid March to early April. There is a second generation of apterous viviparae on the primary host, followed by alate migrants in late April and May. These migrants move to Pteridium, and produce small populations on this host. Throughout the summer this species is uncommon, a situation that leads to very few return migrants in the fall. Macrosiphum osmaroniae is often difficult to find on Oemleria in the fall, but in 1993 it was quite common in one area of McDonald State Forest. Gynoparae and males have not been found on Pteridium despite extensive searching. Gynoparae arrive on O. cerasiformis in September and early October, followed by males in late October and early November. Oviparae can be found in late October and November. 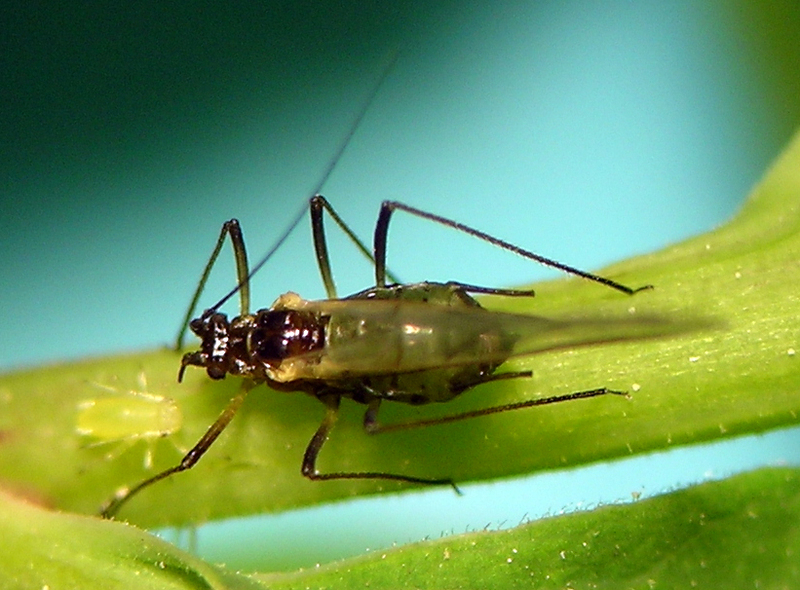 Transfers of this aphid to a species of Dryopteris and to A. filix-femina were not successful. Late instar nymphs could complete development on these ferns, but did not reproduce. Fundatrices feed among the leaves of the unfurling bud. They move to the undersides of leaves and to stems of actively growing shoots only after the bud is nearly unfurled, usually during the development of the second generation. Oemleria plants used as hosts are usually located in deep shade and near streams. The likely reason for this is that plants in this situation retain their leaves much longer into the autumn, and therefore are capable of supporting the autumn generations. When on Pteridium, M. osmaroniae lives on large plants growing in cool, shaded areas. The developing fundatrices are often heavily parasitized by an aphidiine (Braconidae) wasp, Harkeria rufa Cameron. The adult of this wasp is orange-yellow throughout, slightly darker in the thorax. 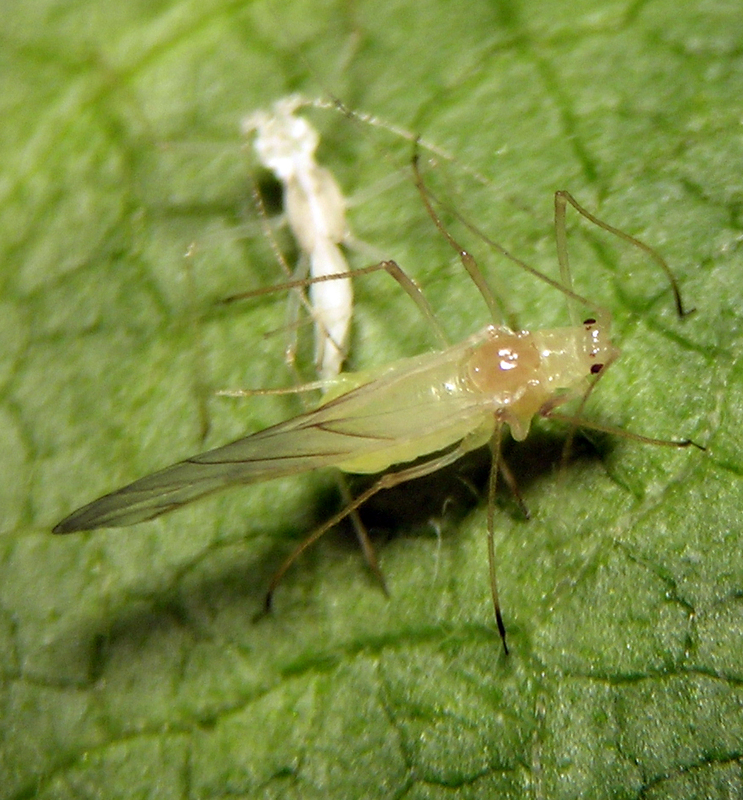 The later generations on Oemleria are also parasitized, but their numbers are rarely dramatically affected. Another aphidiine parasitoid found on this aphid in Washington was Aphidius polygonaphis (Fitch). I still have this species from only British Columbia, Washington, and Oregon. Macrosiphum osmaroniae fundatrix in Olympia, Washington in April. 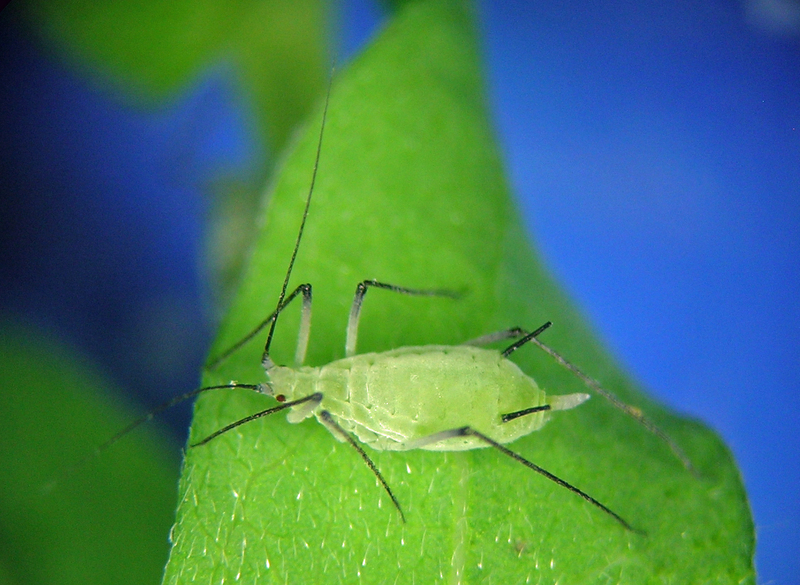 This is a large, common aphid on Vaccinium species across northwestern North America. It was originally collected on Vaccinium parvifolium (red huckleberry), a common species west of the Cascade Mountains, but I have since seen it on several other Vacciniums including V. scoparium, V. membranaceum, and V. ovalifolium. I have also collected it on Menziesia ferruginea, another Ericaceae in the same habitats as infested Vaccinium species. In late 2016 I am starting to suspect that this taxon is more complicated than originally thought, picking up some rather distinctive specimens on an unidentified Vaccinium in southern Oregon. I suspect that more collecting and a closer look at the morphology and biology may elucidate at least one other similar species living on Ericaceae near the west coast. I have material from Washington, Oregon, Idaho, and Montana. Alate viviparae are exceedingly rare — I’ve seen only 3 of them in all these years (my first samples are from 1991). Macrosiphum parvifolii fundatrix from north-central Washington in June. I know I say it all the time, but this aphid is truly my favorite. The reason? This is the first aphid I conducted my own research on. 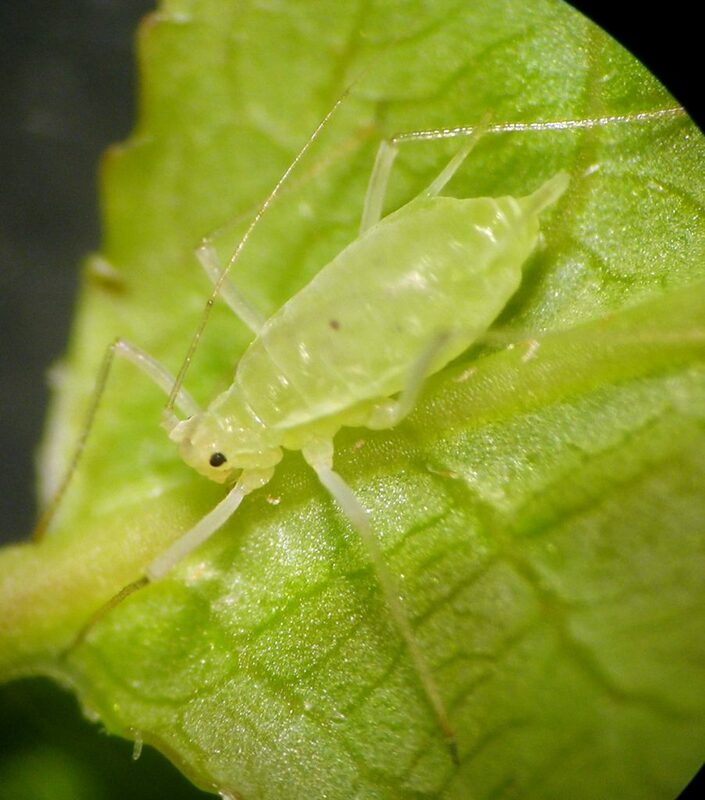 I was practically a pimply-faced kid when I started collecting this aphid, especially finding the beautiful oviparae on Rhamnus purshiana in the fall. In those days this species was thought to be monoecious on that plant, which grows as a small tree in the forests of western North America. Just as I began grad school in 1990 I was beginning to suspect that the story was more complex. What was then considered to be Macrosiphum pteridis on bracken fern, Pteridium aquilinum, seemed to me to be morphologically identical to M. rhamni. So, further study ensued and in 1993 I published on the host alternation of this species, followed by clarification of the nomenclature of the similar fern-feeding Macrosiphum with Jaroslav Holman in 2000, when we wrote of M. rhamni, “The heteroecious life cycle of this species was reported by Jensen et al. (1993), who included evidence from morphology, phenology and host plant transfers. In western Oregon, egg hatch begins during mid February and probably continues through March, depending on location. Adult fundatrices can be found in the Corvallis area from mid-March to late April. There is usually a second generation of apterous viviparae, followed by a third generation made up almost entirely of alate viviparae that settle on Pteridium. In some locations, a small number of individuals remain on Rhamnus throughout the summer. Gynoparae and males mature during late September and early October, and after returning to Rhamnus, can be found until mid-November. Oviparae can be found abundantly from mid-October to late November. One collection of oviparae together with males was made from Pteridium on the Oregon State University campus on 7.x.1990. It is not known if these reproduced successfully, or if any resulting fundatrices were able to survive on Pteridium. A single collection of two apterous viviparae was made from Polypodium hesperium Maxon in Seattle, Washington on 27.vi.1975 by H.G. Walker. I have specimens from British Columbia, Washington, Oregon, Idaho, California, and New Mexico. Macrosiphum rhamni oviparae from the Oregon coast in October. The red internal pigment is typical for oviparae and no other morph. 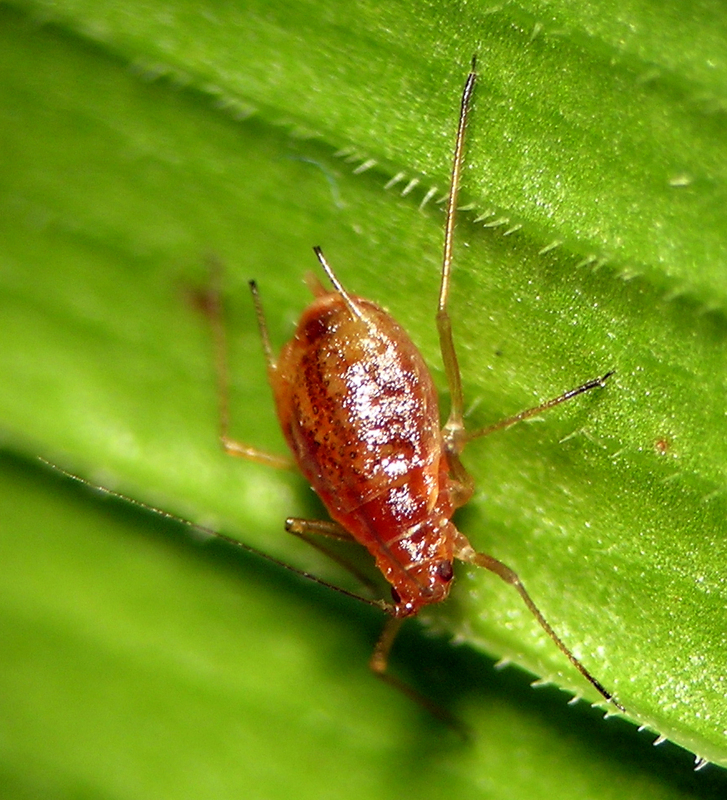 Quite possibly, this is the most widely known aphid species in the Northern Hemisphere. Macrosiphum rosae apterous vivipara from our garden in southern Idaho. 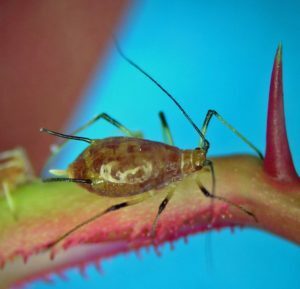 Almost everyone who has a garden, or knows somebody with a garden, or walks by other people’s gardens, knows about rose aphid, Macrosiphum rosae. 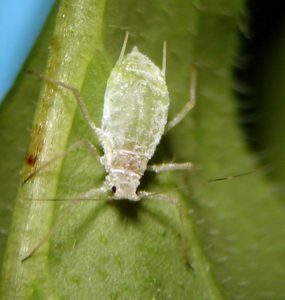 It is the aphid that occurs all across most of the world on cultivated roses. What even some entomologists don’t know, however, is that this aphid also feeds on teasel (the genus Dipsacus), and sometimes other plants such as Potentilla, Epilobium, and Ilex (holly). This aphid is native to Europe, where a close relative (Macrosiphum knautiae) lives throughout the year on Knautia — a close relative of Dipsacus. In most places I’ve lived, M. rosae lives without a sexual cycle throughout the year on roses, or migrates in from places where this is possible. 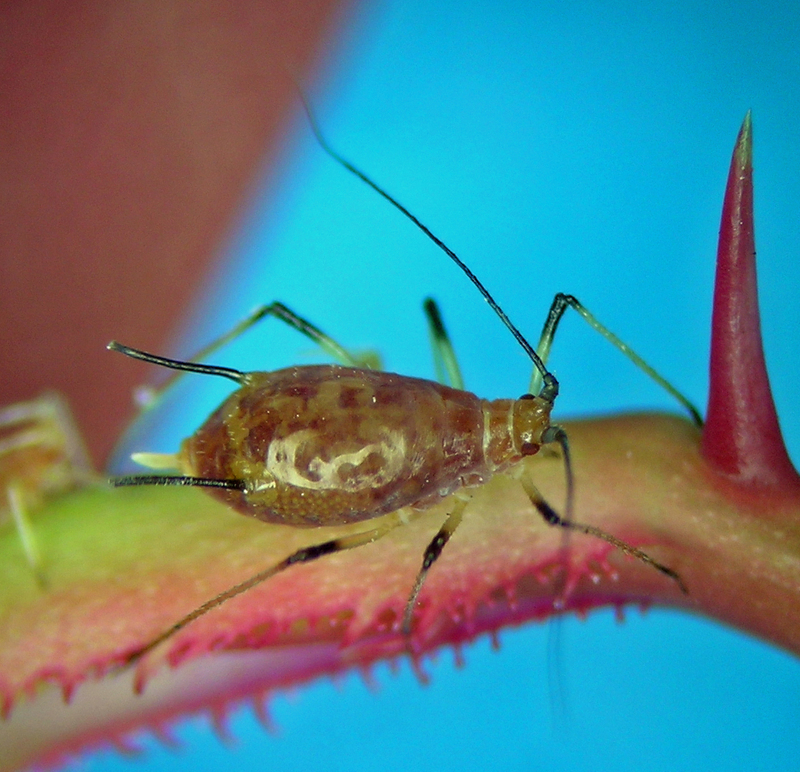 That said, I do have two fundatrices in my collection, indicating a sexual cycle sometimes occurs in northwestern U.S.A.
Macrosiphum rosae alate vivipara colonizing our rose from elsewhere in April. 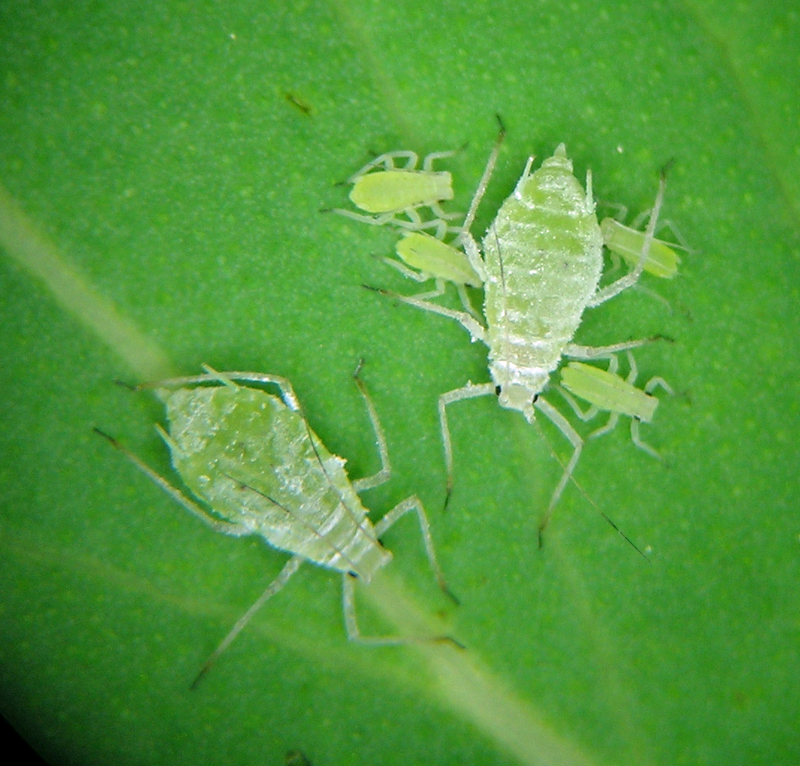 The green nymphs are Wahlgreniella that overwinter as eggs on the same plant. The head and thorax of a feeding alate Macrosiphum rosae. I still remember the first time I found this species after many years of looking on Rudbeckia (its host) everywhere I went. It was in northern Idaho along a meandering stream that at intervals broke out into wide marshy ponds. Moose were nearby, and I found this aphid on the lower leaves of tall Rudbeckia plants adjacent to a moose trail that crossed the stream. 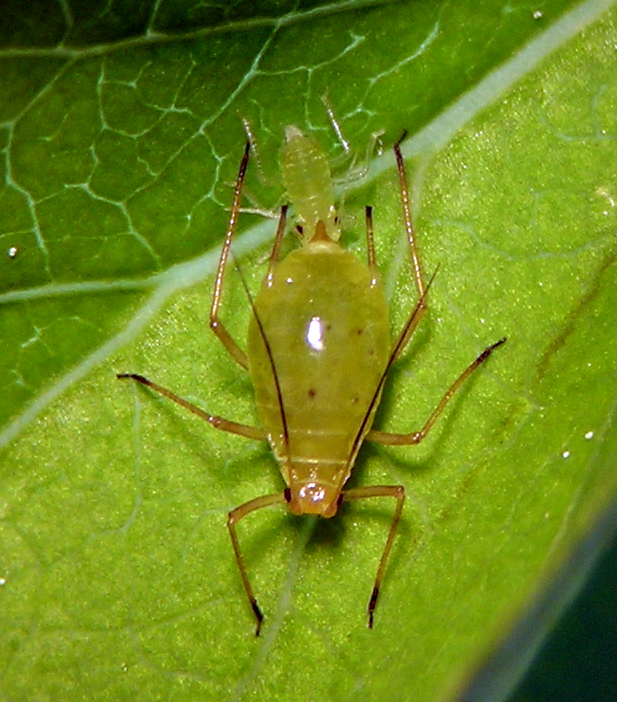 Just as described by earlier authors, this aphid lives on the lower leaves of its host, and appears to be mostly restricted to the more interior mountains of Idaho and adjoining states. Like so many species of Macrosiphum in North America, it is generally similar to M. euphorbiae, but in life appears to be more long bodied and bigger in general, and finding it on the lower leaves in cool shaded locations is also a good hint. In one location in Utah, in the hills above Salt Lake City in the fall, I was collecting Macrosiphum on the leaves of both Rudbeckia and Agastache in the same location as was M. euphorbiae. After mounting, I found just how similar these species are. It seems to me that Macrosiphum has recently diversified in the West, leaving biologically distinct species very similar in morphology. Macrosiphum rudbeckiarum alate vivipara from northern Idaho. Macrosiphum rudbeckiarum in northern Idaho, the apterous vivipara. I recently described this species after many years of collecting it and getting to know its biology in the field. In my 2015 paper I wrote, “This species has been found almost everywhere that I have seen its host, L. utahensis. Fundatrices live singly on the undersides of leaves, and are dusted with highly variable amounts wax, as are their offspring. 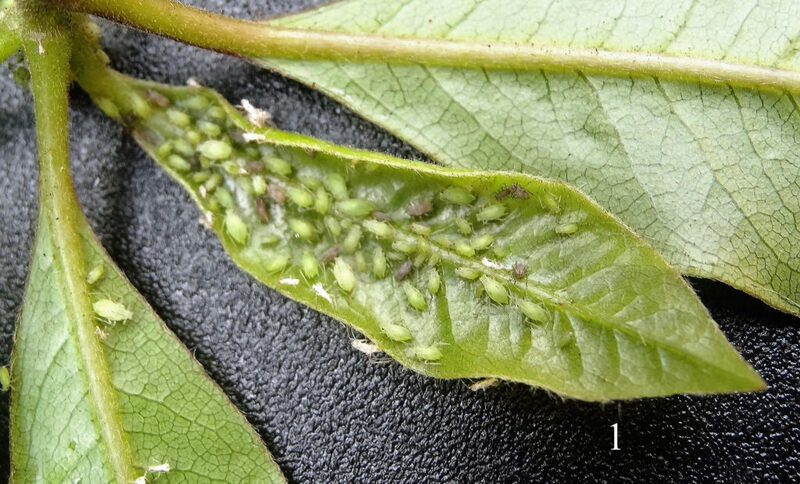 Recent presence of the aphid can often be detected by the waxy residue left on the leaf surfaces. 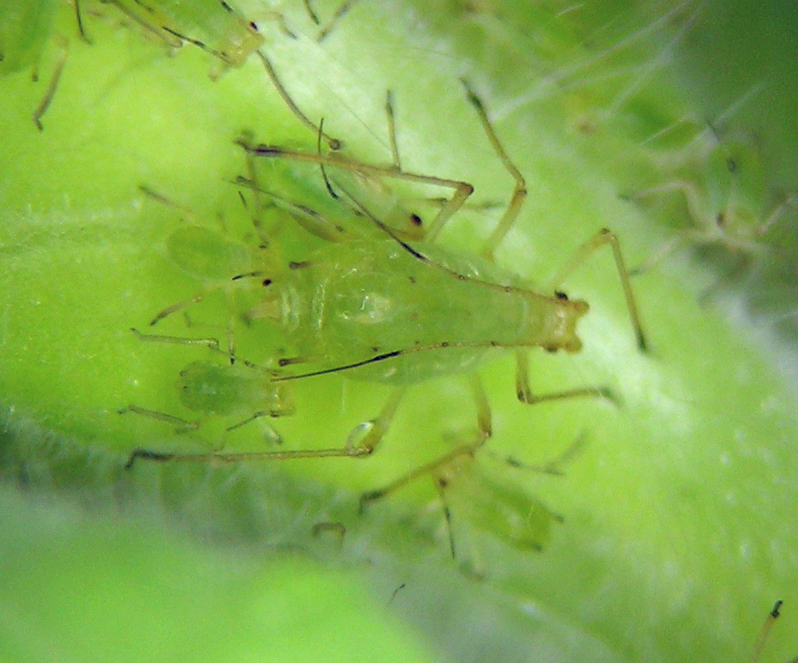 Aphids congregate on flowers and fruits when they become available, until fruits are fully mature. Alatae seem to be produced primarily during fruiting of the host plant. 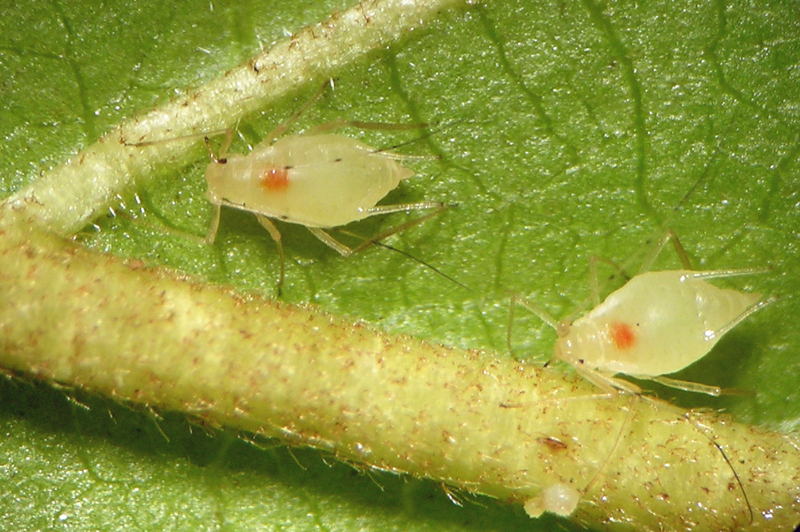 In any given forest location this aphid is usually widespread but in low numbers on each host shrub, living both in heavily shaded areas and exposed slopes and clearings. Lonicera utahensis is known from southern British Columbia and Alberta in the north to Wyoming and Utah in the south (Kershaw et al. 1998). I still have material from British Columbia, Washington, Oregon, and Idaho. Macrosiphum schimmelum fundatrix from the Blue Mountains of Oregon in early July. This common species is one of the biggest and spindliest aphids I know. It feeds on elderberries, genus Sambucus (Caprifoliaceae), and is found from the Rocky Mountains to the ocean coast. I’ve seen it in habitats from dry steep slopes of mountains in New Mexico to the deepest darkest understory of western Oregon rain forests. I have material of this aphid from British Columbia, Washington, Oregon, and Idaho. Macrosiphum stanleyi apterous vivipara from Tillamook County, Oregon, along the Nehalem River. 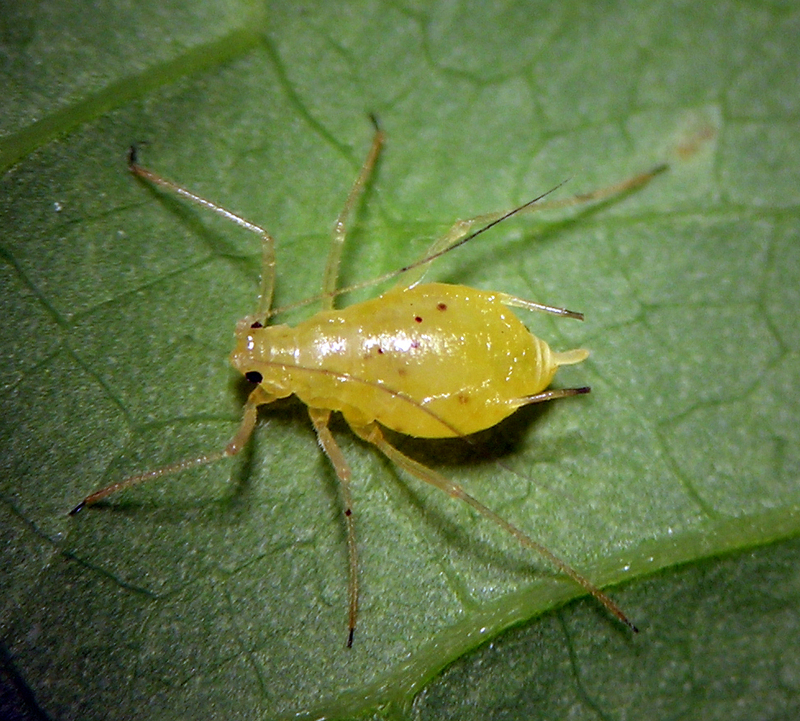 I worked on the field biology of this species for several years in grad school, it being one of the aphids I searched for during my weekly trips to McDonald State Forest outside of Corvallis. During that time and in that location, it seemed to be anholocyclic on its hosts in the Saxifragaceae (e.g. Tolmiea, Tellima, and Mitella), almost completely disappearing during the summer and appearing seemingly from nowhere in the spring. Since that time I was lucky enough to find M. tolmiea in the fundatrix stage on the lower slopes of Mt. Baker in Washington, confirming that at least sometimes it is holocyclic. I still have material only from British Columbia, Washington, and Oregon in the wet forests west of the Cascade Mountains. Macrosiphum tolmiea from Tillamook County, Oregon, near the Nehalem River. This is an aphid I had the pleasure to work on with colleagues I’ve never met in Mexico (and California!). They found M. tonantzin living on the non-native tree Pittosporum undulatum in Mexico City. 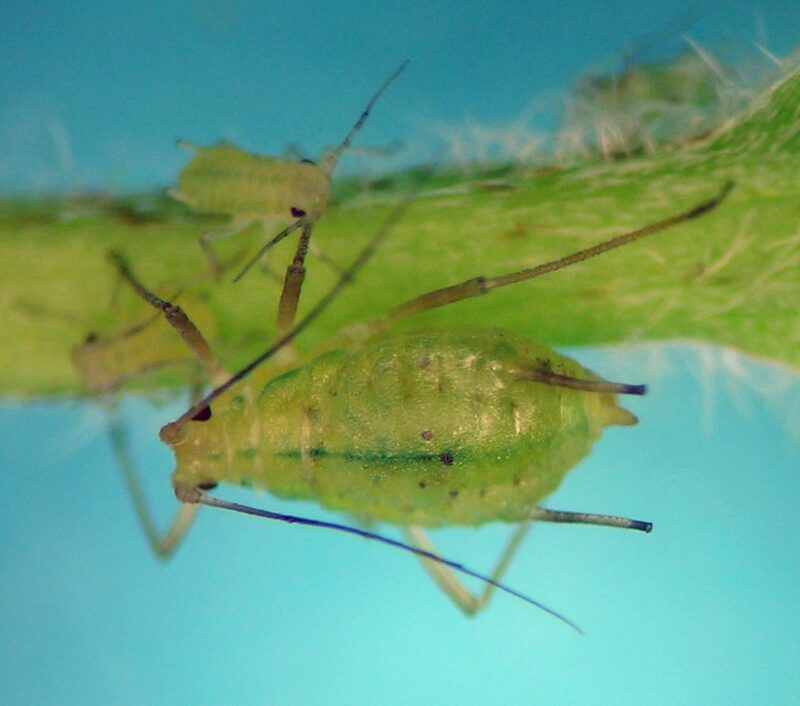 In the paper describing this species, we wrote, “So far this aphid is only known from a single site in Xochimilco area of southern Mexico City. Here, it lives throughout the year on the growing tips of ornamental trees of P. undulatum. The second and third authors have observed that P. undulatum is not a common plant in Mexico City, and the site where they find M. tonantzin is the only site they have seen this plant. Further, they note that Pittosporum tobira (Thunb.) W.T. Aiton is common in Mexico City but despite extensive searching they have not been able to find M. tonantzin feeding on it. 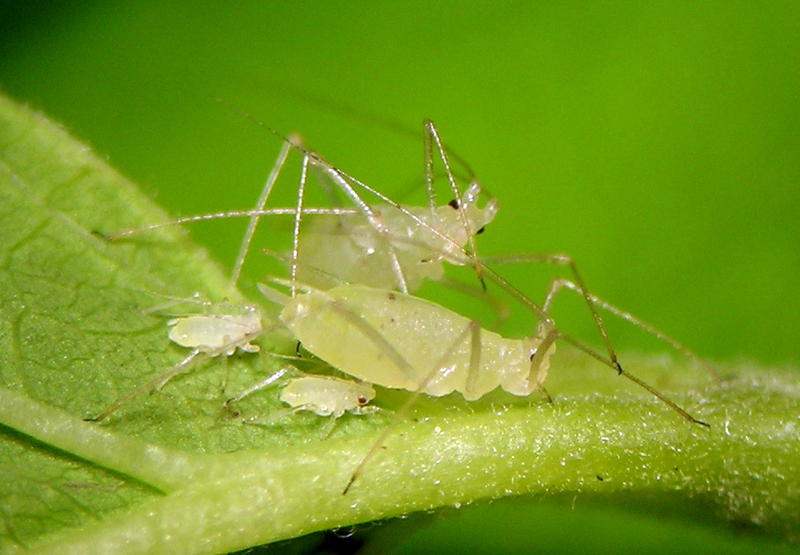 The production of alate males starting in December, in the absence of oviparae, suggests that this aphid’s native biology may be heteroecious. The species is, however, so far not known from any native plants. … The species is meant to honor the Nahuatl name for an Aztec mother goddess.” My hypothesis presented in this paper was that M. tonantzin is a species native to Mexico that has successfully acquired P. undulatum as host. 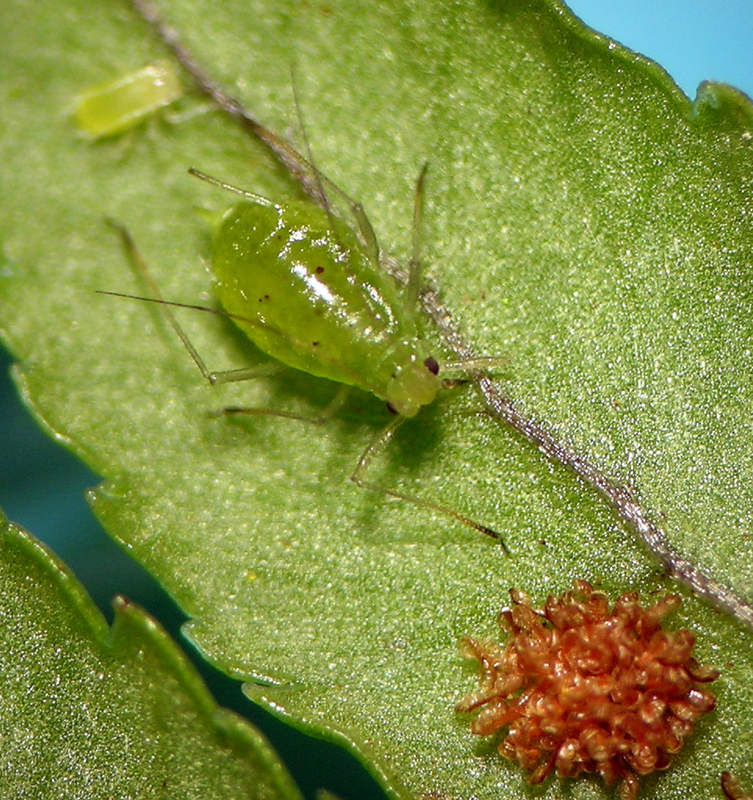 An alternative hypothesis, that this aphid is native to Australia or another place where Pittosporum grows naturally, cannot be entirely discounted, however. I know this species from British Columbia, Washington, and Oregon. Macrosiphum tuberculaceps aptera from the Cascade Range of Washington. 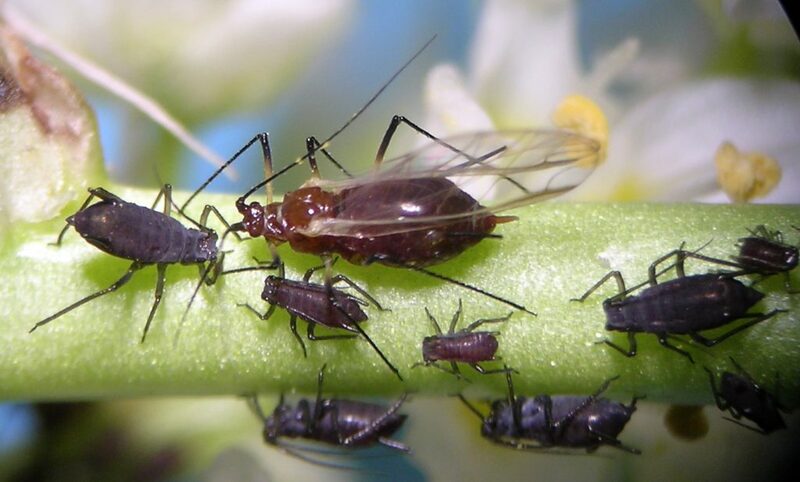 In that paper I wrote, “Host plants I have witnessed this aphid reproducing on in nature include: Apiaceae – Lomatium sp. ; Asteraceae – Taraxacum officinale; Brassicaceae – Arabis sp. ; Melanthiaceae – Zigadenus sp. ; Onagraceae – Epilobium angustifolium L.; Rosaceae – Geum macrophyllum, Geum rivale, Geum triflorum Pursh, Potentilla sp., Rosa acicularis; Scrophulariaceae – Pedicularis groenlandica, Penstemon sp. ; Valerianaceae – Valeriana sp. Additional hosts recorded in the literature include: Asparagaceae – Camassia scilloides (Raf.) Cory; Asteraceae – Hymenoxys hoopesii (A. Gray) Bierner, Rudbeckia sp. 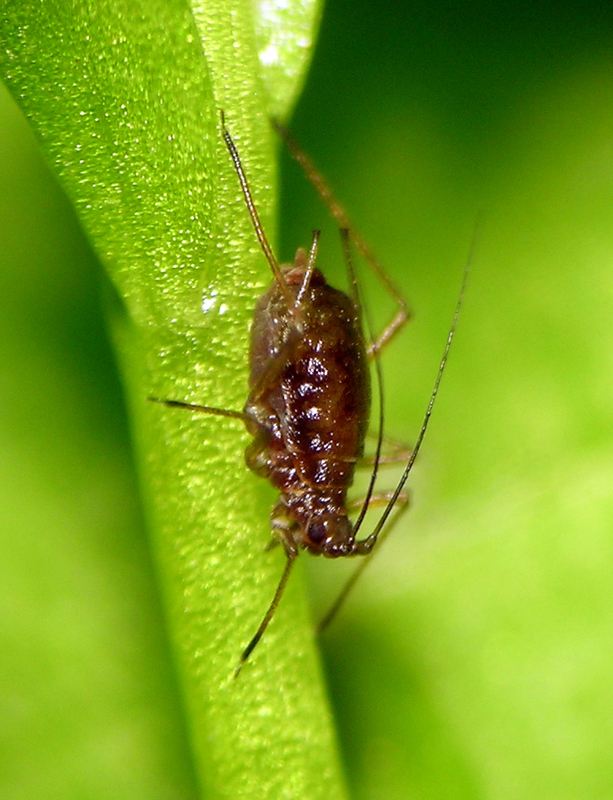 This aphid is monoecious holocyclic, probably with several overwintering hosts. On 29 May 2010 at about 1000 meters elevation, many Zigadenus plants were supporting colonies of M. valerianae that had been established by alate viviparae. A few colonies were found that were older and had a single fundatrix and an occasional apterous vivipara. It was clear in that site and time that fundatrices were quite old, and that most of their first generation offspring had been alate. I now have two slide boxes devoted to this species, having collected it from British Columbia, Quebec, Washington, Oregon, Idaho, Colorado, Wyoming, and New Mexico. I was lucky enough to get some good photos over the years as well. Macrosiphum valerianae fundatrix collected on Rosa near Lakeview, Oregon. Macrosiphum valerianae apterous vivipara feeding on Camassia in central Washington. Macrosiphum valerianae alate vivipara feeding on Camassia in central Washington. 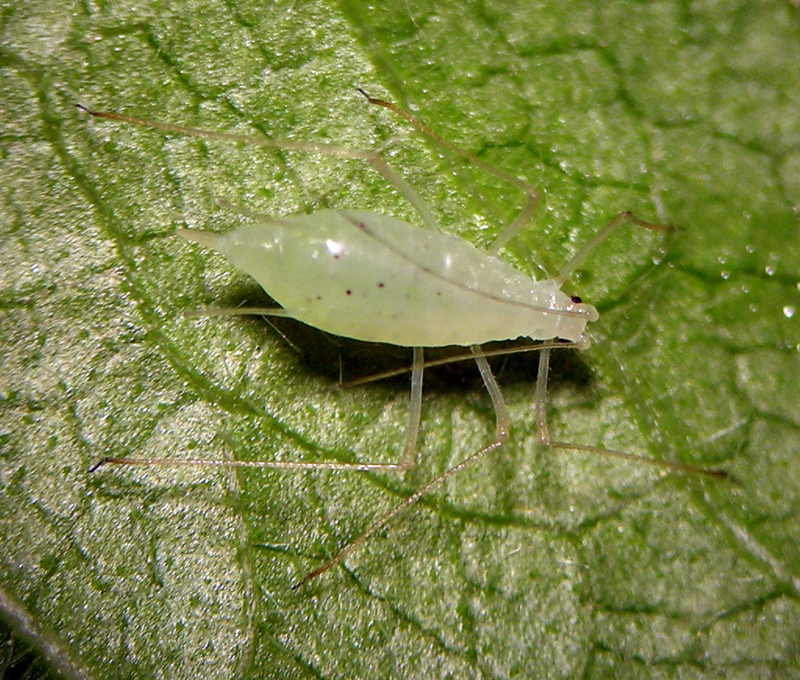 Another fondly remembered aphid, this is also one I was the first to discover during the early 1990s. It is striking that this species and M. tuberculaceps often live in the same forests, on related and peculiar herbs in the Berberidaceae. In the McDonald State Forest where I studied aphids for grad school, this aphid was fairly easy to find, but outside of that habitat I have searched hundreds or thousands of its hosts, Vancouveria hexandra, and found it only a few additional sites. Any time a species I’ve described is so hard to re-collect after the description is published, I start to wonder whether the whole thing was my imagination. This feeling has been particularly acute with M. vancouveriae until last September when I finally found it again on the Rogue-Umpqua Divide in Jackson County, Oregon. I still have material only from Oregon. Macrosiphum vancouveriae apterous vivipara from the Rogue-Umpqua Divide in Jackson County, Oregon. Another obscure and uncommon species I discovered in McDonald State Forest in Oregon during my Ph.D. thesis work. I published on it in 2000, commenting as follows, “This species is monoecious holocyclic on its host Viola glabella Nutt. Egg hatch in the Corvallis area occurs as the leaves are unfolding in March. Fundatrices mature by mid-April. Aphid numbers reach their peak during flowering in late-emerging plants and fruiting in earlier-emerging plants. Apterae reproduce slowly throughout the summer, rarely producing alatae. Sexuales are produced in September and October. Like a number of aphids that live on herbs in the forest, this species is found only in microhabitats where the host plant is able to remain vegetative throughout the summer into fall. In many sites Viola glabella dies back well before fall due to dry soil. I still have only found this aphid in Oregon and Washington. Macrosiphum violae aptera from the Cascade Range in Washington. This is one of the fern-feeding species that I studied extensively for my 2000 paper with Jaroslav Holman. At the time I believed it to be anholocyclic with a wide host range on various ferns. Since that time I have become less certain as I study material from additional ferns and geographic locations. For example, I have alate viviparae collected on Holodiscus discolor in the mountains of New Mexico that would key to this species very easily. Similarly, I have abundant alate viviparae on a roadside fern at high elevation in the Washington Cascades that give the impression of being different from other M. walkeri. More recently, I collected a couple specimens in a very dry habitat on an unidentified fern growing under a Ponderosa pine in the very interesting location called Devils Garden in Klamath County, Oregon. In the latter location, anholocyclic overwintering seems far fetched due to the extreme winters, yet these specimens were found in early May. So, I think much work is yet needed on material that would key to M. walkeri. I have material from British Columbia, Washington, Oregon, Idaho, and New Mexico. Macrosiphum walkeri apterous vivipara on Polypodium near the Bonneville Dam in Oregon. I discovered this species during my Ph.D. thesis work, originally in the wet flat land of the central Willamette Valley of Oregon, hence the species name. It was published in 2000 (see my list of publications above). 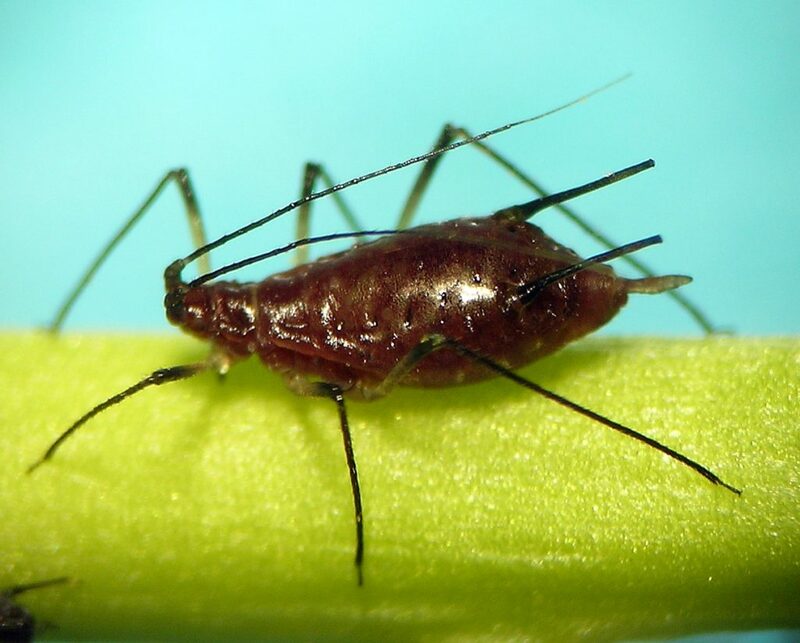 Since the original description I have found this aphid in many other places, and its known range now includes British Columbia, Washington, Oregon, Idaho, and Montana. Macrosiphum willamettense apterae and nymphs from central Washington. I named this species after one of my heros of aphid taxonomy, H.F. Wilson, who worked in Corvallis, Oregon in the early 20th century. I described this species in 2000 and since have had a little remorse about the decision — I am not sure how many species we have in northwestern North America on the big forest lilies. It seemed clear during my Ph.D. work that there were two, M. wilsoni, and Macrosiphum insularis Pergande. However, several samples I have seen from Idaho and British Columbia have made me doubt my judgement back then. Anyhow, maybe more field work will resolve the issue. I now have identified this species from Oregon, Washington, British Columbia, and Idaho. Macrosiphum wilsoni aptera from the forests near Hayden, Idaho. This is a really fabulous aphid, probably a close relative of M. albifrons. Although the specimens in the photos are yellow and green, M. zionense is often a beautiful orange color, with striking dark siphunculi and tibiae. It feeds on a plant called Thermopsis (‘golden pea’) in the mountains of the interior west of North America. 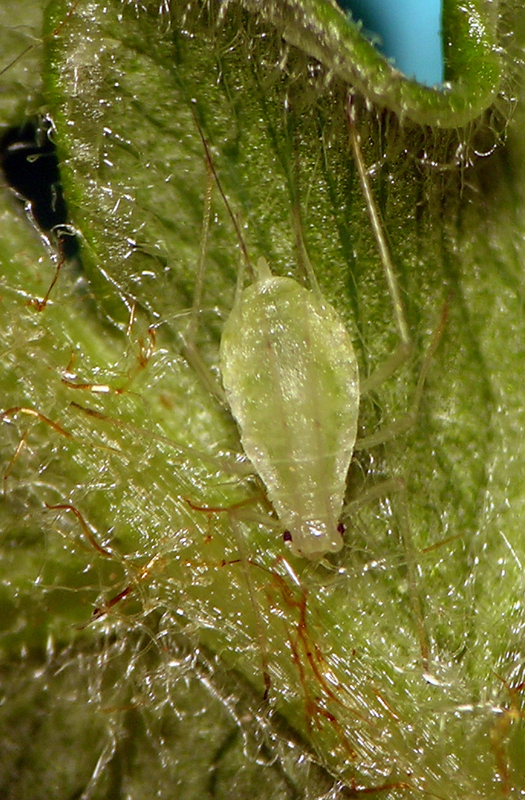 Throughout most of the season the aphids are found on the upper stems of the plant, but later in fall as the plants decline and the aphids transition to the oviparous female and male stages, they are found on the lower stems of the plants, just above the soil level, or on stems of plants that have fallen over during the growing season. I have specimens from Oregon and Idaho. Macrosiphum zionense fundatrix, the golden color form. Macrosiphum zionense aptera, the green color form (obviously) — it can also come in bright orange.